Considering the weather I had one of my most enjoyable nights camping for a long time. Warm and dry and with the wind and rain battering the tent I felt extra cozy and comfortable. It had been worth the extra weight of taking my full length down mat with me, nearly as good as being in a bed. The sound of the waves only a few metres away added a hypnotic quality to the camping experience. 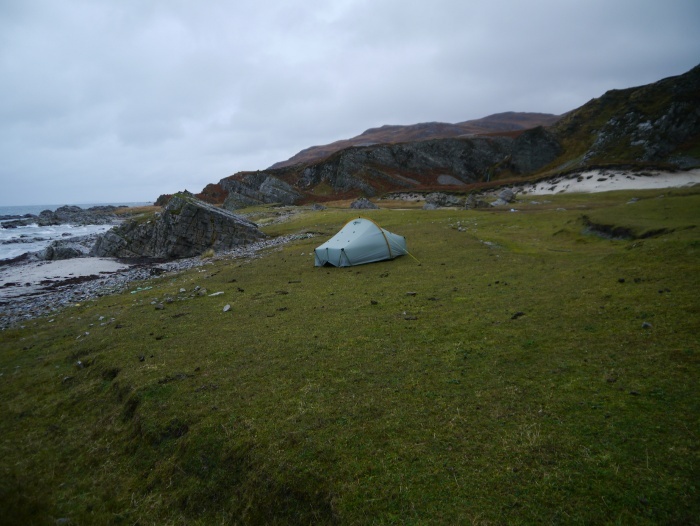 It’s not very often that I get to hear the sounds of the sea when wild camping. I woke just after dawn and just had to get out to do what I had been putting off for most of the night. You can never describe the experience of putting on wet waterproofs and boots first thing in the morning as pleasant. Especially when you are exiting straight into wind and rain. Once out of the tent the rain was not as heavy as it had sounded whilst laying in my sleeping bag, tents always managing to amplify the sound. The first thing that I noticed was various deer and goats running away as fast as they could, human presence once again causing panic. Although they must have know that we were there all night, simply hidden under technical nylon. With business concluded I went and chatted to Rich and set a rendezvous time to synchronise taking down our tents. Back at mine I went thought the slow process of taking off waterproofs and getting back inside without getting anything wet. This I managed but a quantity of sand had hitched upon my person and was deposited within my inner tent. That gave me something to grumble about whilst eating breakfast. 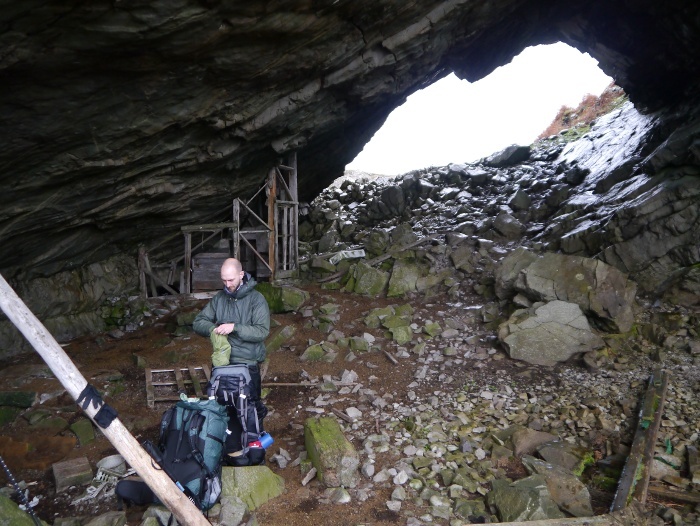 I had my tent all packed away at the rendezvous time but Rich was still ensconced in his so I legged it up to a shallow cave to seek shelter from the elements. This gave me a great view of a pillar of rock that was towering above the middle of the bay. It looked like a giant drill bit that had emerged from the bowels of the earth, spiraling out rock and sand as it punctured the surface. With both of us packed and ready we set off up over a sandy rise where we were faced with another perfect bay, backed by a giant sand dune. Once again the wild camping possibilities were pretty much endless. We both discussed returning one day to spend a warm and dry evening in front of a driftwood fire, watching the sun set. 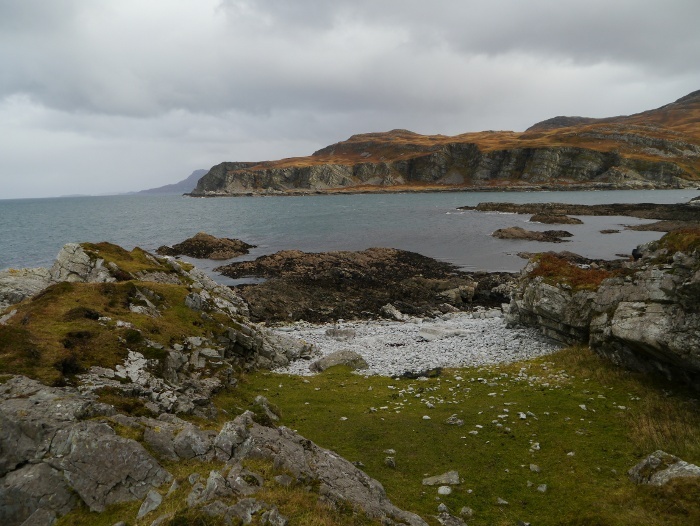 At the end of this bay was a huge rock arch, a tempting place to have a fire during a wet night. A pile of driftwood and a fire circle showed that previous visitors had done just that. We were tempted to try to stick as close to the coast as possible, both to remain sheltered from the elements and because the rock architecture was stunning. However the way ahead looked like it was blocked at the far end of another bay, the possibility of a difficult scramble directly above the water. With heavy packs and greasy rocks this was not very appealing so we climbed onto the hillside above. This was also not very appealing in a different way as we were soon walking directly into intermittent wind-driven rain. My camera remained safely inside my rucksack for much of the day, managing only a few snatched shots when the rain became lighter. There was a period of about half an hour when the rain became rather intense and the wind picked up even more. It really was a miserable experience walking directly into it, a matter of simply putting our heads down and thinking of a nice dry bothy later that afternoon. When rain is being blown directly into your face you realise that waterproofs have a real design flaw. This being the huge great hole for your face to stick out of. I soon had the familiar sensation of cold water dripping down my chest, soaking my base layer. My rucksack started to feel heavier with every passing minute. 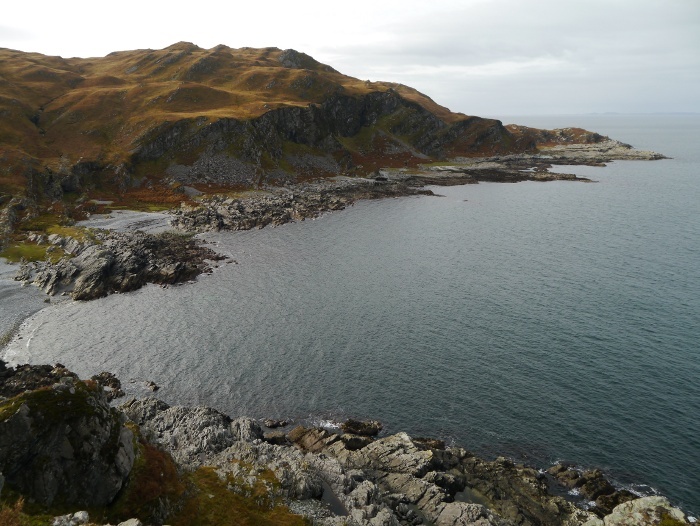 We spotted a long section of coast below us that looked navigable, a narrow rocky arête leading us back down to sea level. The arête turned out to be the roof of large arch / cave that provided some welcome shelter from the weather. The cave had an old wooden structure built into it, including shelving and that may have been an enclosed room. 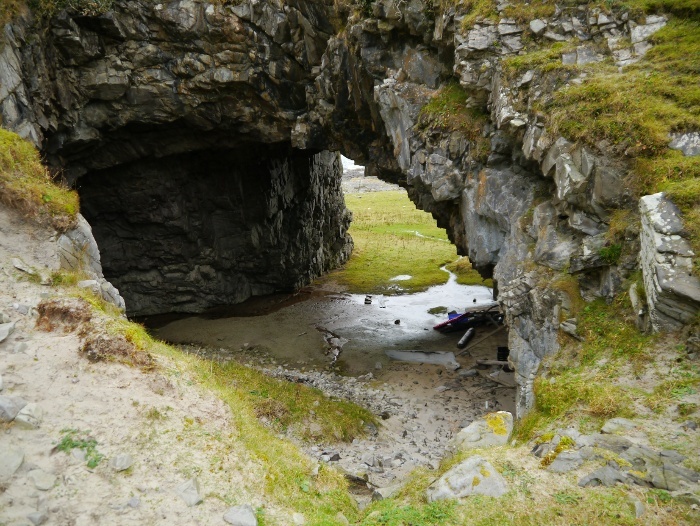 I wondered if this was the cave in which the artist Julie Brook had spent three years living in. 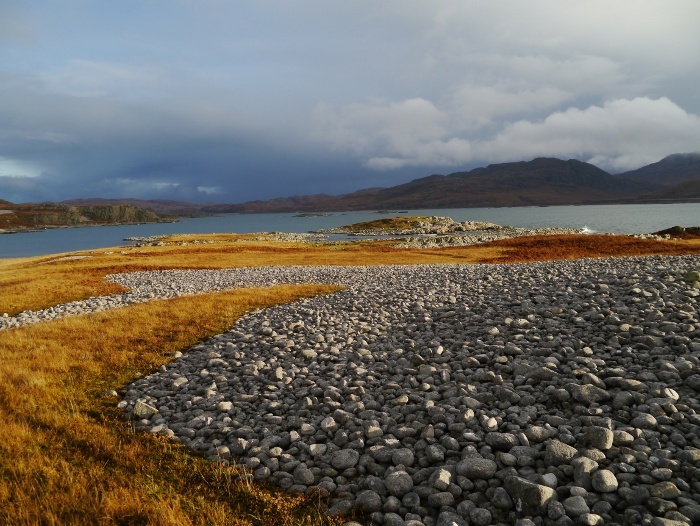 An article from the Independent describing her time on Jura can be found here. I can say that after only spending four days on the wild west coast she must have been incredibly tough and resilient to spend so much time alone in such an inhospitable spot. Standing around in our sodden clothing we soon began to feel chilled so set off once more into the rain. We followed the shoreline for a while, tough going on the large slippery pebbles. We found this rather tiring so once again took to the line of low cliffs, passing under a small rock arch some distance from the sea. 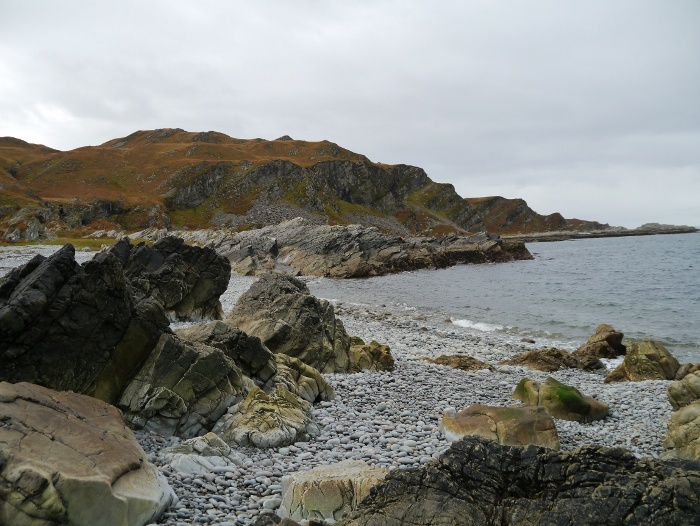 I had heard that Shian bay is one of the jewels of Jura and suddenly it was stretched out in front of us. As we started the descent from a low hill the coastline was a flurry of movement as numerous deer and goats ran away as fast as they could. It was an impressive sight, I have never seen so many wild beasts all in one place in the UK before. A little while earlier we had spooked a stag from a short distance. As usual he immediately galloped away but managed to lose his footing. It is not often that you get to see a large stag complete with an impressive set of antlers do a forward roll. He continued on his way unharmed, leaving behind two very wet backpackers with smiles on their bearded faces. It had to be said that Shian bay and its surroundings smelt bad, really bad. We kept expecting to find something very dead and very large washed up on the beach. It really was unpleasant. There was a lull in the rain so we had a break behind a grassy bank, soon getting chilled in our damp clothing. With the rain returning we trudged on round the bay, not managing a photo as my camera was once again back in my rucksack. I don’t know if my expectations were too high, the weather was too rubbish, or the smell too bad but Shian bay was an anticlimax. I think that it is the sort of beach that may look its best under sunny skies and without rain water dripping down your chest. Climbing south out of the bay we walked though probably my favourite section of the coast so far. 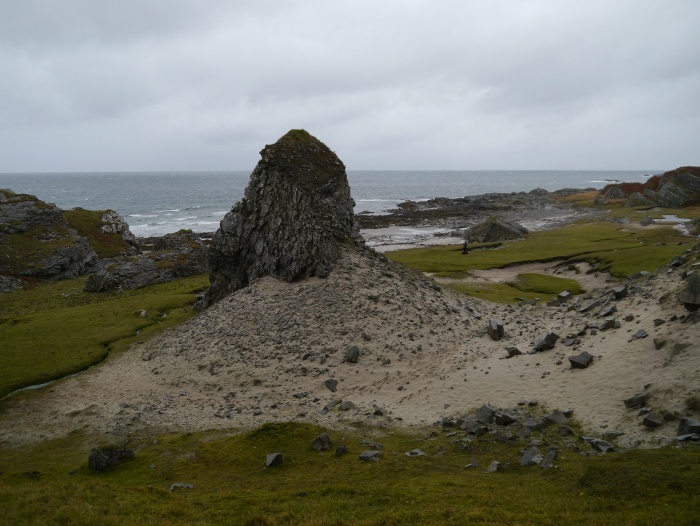 The moors were covered in some huge and spectacular raised beaches. These reflect the changes in relative sea levels as ice sheets advanced and retreated during the ice age. Some of these massive beaches are up to a kilometre inland. They are composed of large pebbles and are almost devoid of any vegetation. From a high vantage point we were able to see just how extensive they are. They are also very hard to walk across and we picked our way between them, following animal tracks whenever possible. 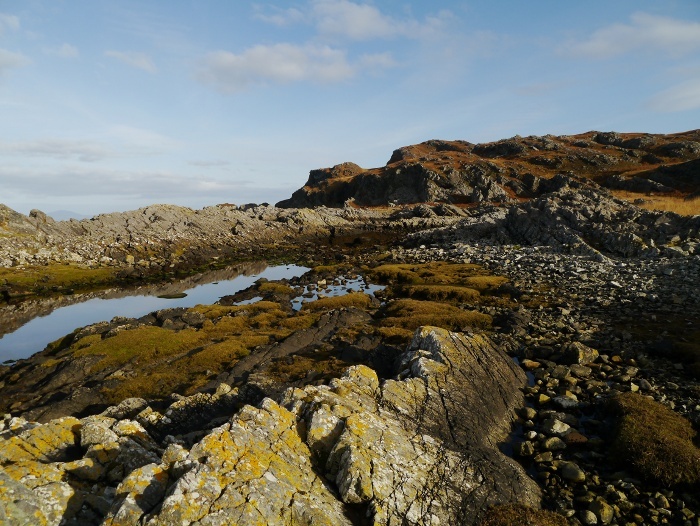 Throughout our journey along the west coast we had gauged our progress by watching the flat outline of Colonsay in the west. The weather had started to improve, the wind dropping and the rain becoming lighter. As the first small patches of blue appeared in the sky above we could feel our spirits rise. The weather probably had not been ‘that’ bad but after spending twenty four hours exposed to the rainy elements the chance to unzip our waterproofs was exceptionally welcome. Visibility even improved enough so that the Isle of Mull became visible once again, previously hidden in the murk to the north. We soon found a good argocat track which appeared to be heading in the direction of Ruantallain, our planned destination for the night. With the going underfoot now easy and the rain finally stopped we sat and snacked for a while, finally relaxing after a challenging day. Remarkably for such a remote spot we had full mobile signal, various texts being pinged back home. The bothy at Ruantallain remained hidden until the very last moment as we picked our way down though a low band of crags. If we had not known it was there we probably would have passed by without spotting it. I like how its weather beaten exterior blends in against the surrounding hillside. It is a row of two cottages owned by the estate, a single room at the end being kept as an open shelter for weary travellers. I have to admit that I was very excited to have finally reached this spot, it is a place that I have wanted to visit for years. Two previous planned visits had been thwarted by illness and bad weather. We dumped our rucksacks inside the bothy and set straight off in search of driftwood, initially heading north, sticking to the water’s edge. Passing a large cave we entered a fascinating world of rock, finally culminating in a tiny rocky cove, access further up the coast being blocked by cliffs. There was a strange noise and then we spotted two baby seals close to the water’s edge, one white and fluffy and the other the colour of one of the surrounding boulders. They were pretty damn cute to be honest, their large eyes watching us. It was tempting to creep up close to get a photo, but this may have alarmed them so we kept our distance. With no driftwood found we wandered back to the bothy and headed south to see if there was any there. 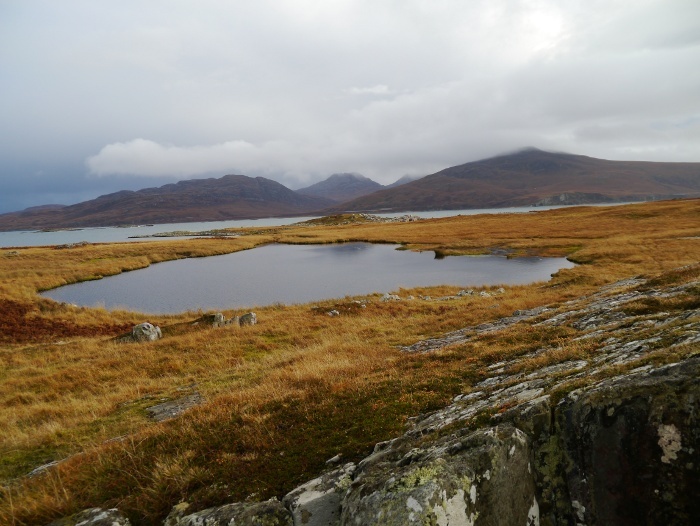 There is a small lochan in front of the bothy with the Paps of Jura across the waters of Loch Tarbert. 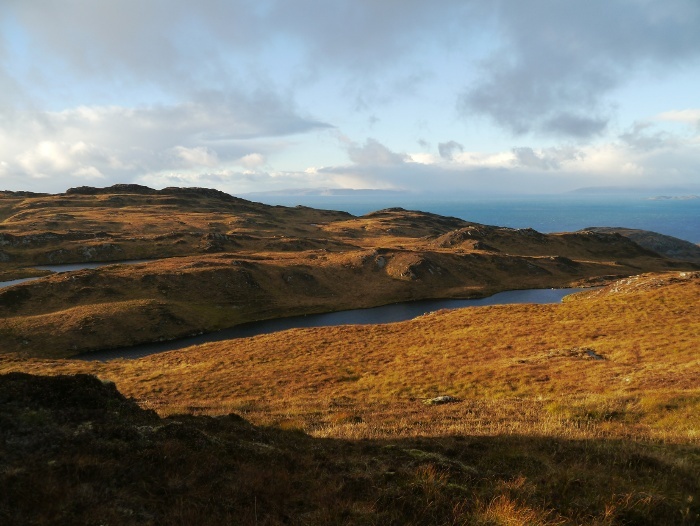 The environs of Ruantallain are simply magical with the view of mountains, sea and a long sinuous loch. The light was constantly changing as we walked to the water’s edge, our quest for driftwood quickly forgotten. The air was full of the noise of baby seals, invisible at first our eyes slowly picked then out along the shore. They are really well camouflaged and hard to see until they move. A couple of adults bobbed away close by. I have to say that this area is one of the most stunning I have ever visited. It was more than worth the long walk to get there. I reckon that it could be the spot to ask for my ashes to be scattered when the time comes. Not only is the place spectacular but it is awkward to get to. I quite like the idea of making those carrying out my wishes slog through bog for about seven hours from the nearest road. 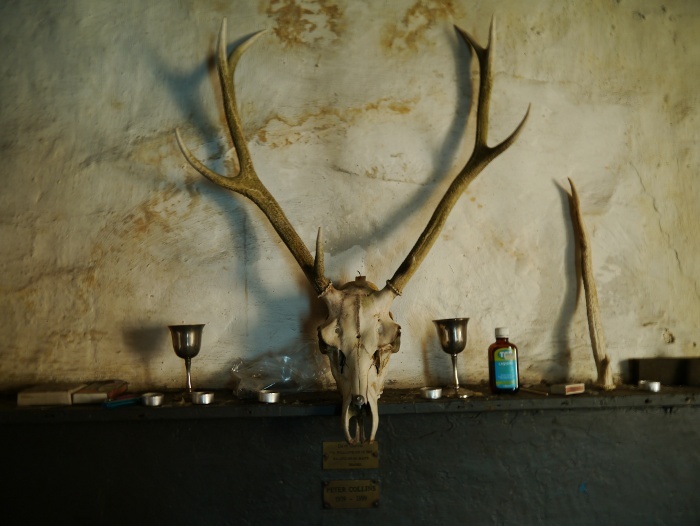 We eventually returned to the bothy empty-handed. The open room is cosy with its wood-paneled walls and floorboards. Rich decided that he was going to pitch his tent and sleep in the garden, whilst I decided to stay in the bothy. There are three ancient rusted beds in there which all looked remarkably uncomfortable and like they would quickly burst an airbed and wreck a sleeping bag. I made a nest on the floor on a dusty old carpet in the fading light. I went outside to see how Rich was getting on and was stopped in my tracks by the spectacle going on towards the west. 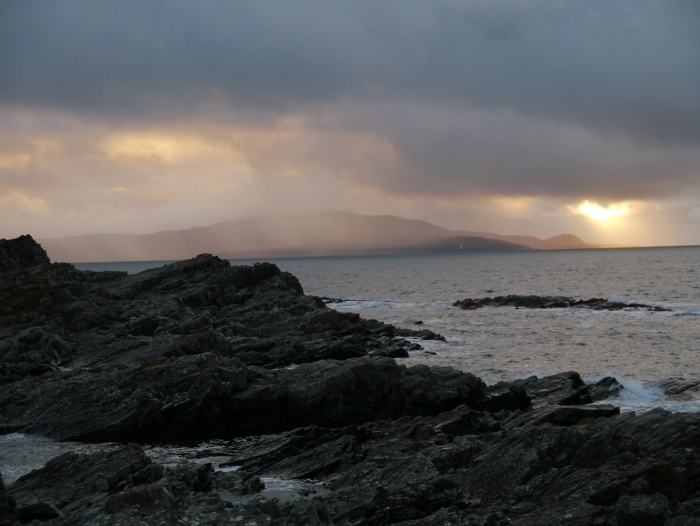 The sun was setting below a boiling mass of heavy clouds across the northern tip of Islay, bands of rain moving across the island. It was like a giant spotlight was being beamed through holes in the clouds. We both stood and watched until the sun finally sank below the horizon. A most enjoyable evening was then spent in the bothy, a tiny fire with few scraps of wood burning more for effect that warmth. Before bed we spent a while wandering about outside under a bright moon, the hills silhouetted against the dark sky. Rich retired to his tent and I went back to the bothy to get another excellent nights sleep. With the aim of starting walking at 7.30am, we were both up at 6.00am. It was still totally dark outside whilst I made my first cup of coffee. I went out to watch the moon which was just beginning to set towards the west. At the same time the sky to the east was beginning to brighten. 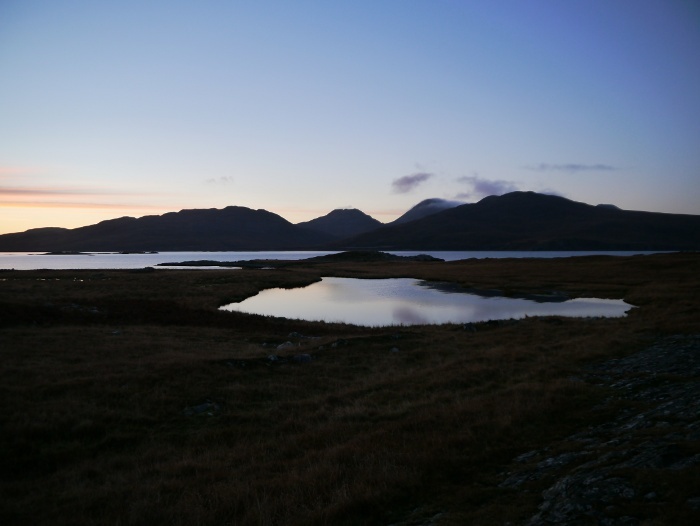 The Paps of Jura across Loch Tarbert were still silhouettes against the clear sky, a few wisps of mist hanging over their summits. As it had been such a clear windless night Rich’s tent was dripping with condensation, making me feel glad that I had spent the night in the bothy. It was good to be able to pack all my gear away dry for once. Back outside I was transfixed by the light show to the east as the sun made its slow journey above the horizon. I need to make an effort to see more sunrises as under the right conditions they are rather special. We left the bothy more or less on schedule, an early start necessary as we had a lot of rough mileage to cover and a ferry to catch back to Islay. 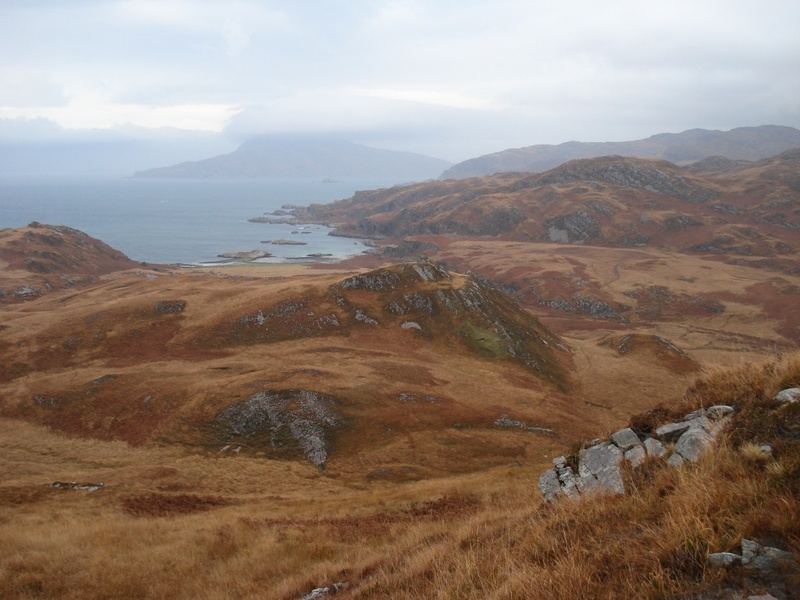 We climbed the slopes above the bothy and picked up an argocat track eastwards, climbing above and away from the shore. It would have been good to explore this section of coastline but were aware that it would add a lot more time and effort to the day. 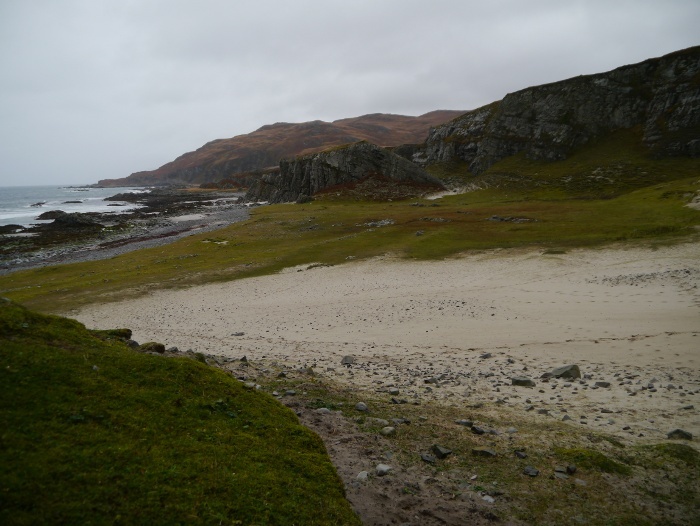 Our climb however was rewarded by some spectacular views over large raised beaches and across Loch Tarbert. Despite numerous ups and downs the argocat track gave good easy progress through the rugged terrain. Then it suddenly deserted us. One minute we were marching happily along, the next floundering through boggy tussocks. We had no idea where it had disappeared to and we resorted back to following indistinct animal tracks. On the ground the landscape was much more complex than appears on the map, I had to really concentrate to locate our exact location each time I got it out to check. 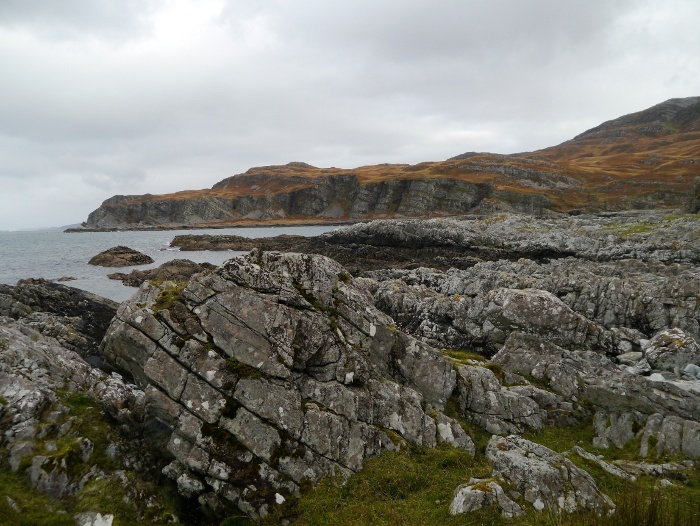 The Garbh Uisge proved too tricky to cross higher up so we descended to the coast where it became wider and shallower. 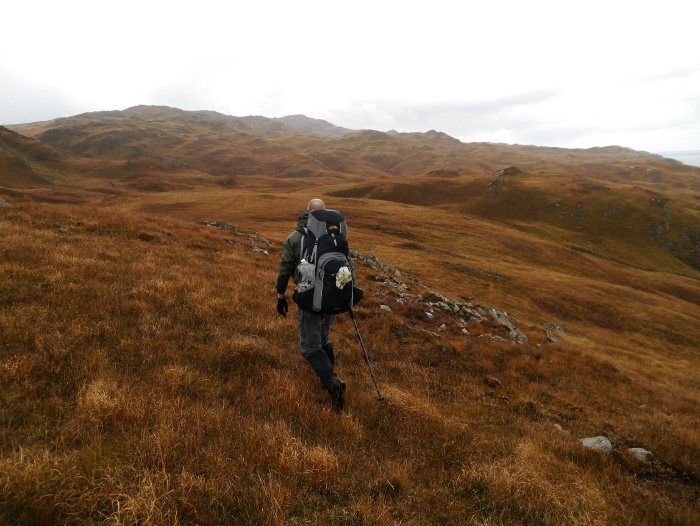 Although now on our fourth day walking across Jura our boots could not get much wetter or heavier. An extra boot full of water was no longer a trip breaker. 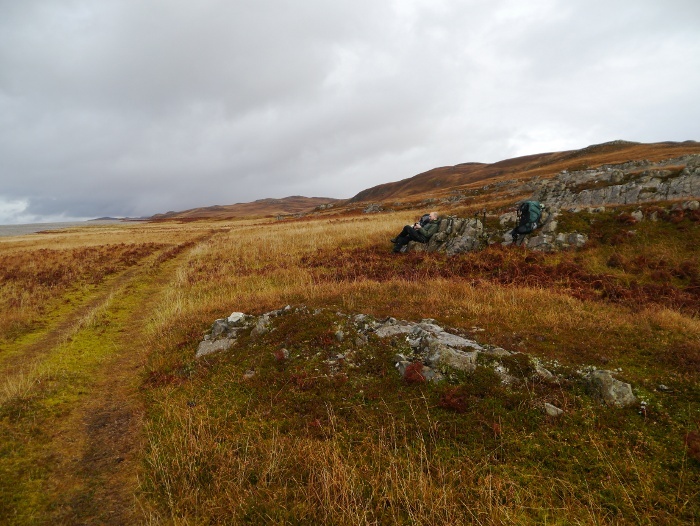 We were heading for Cruib lodge, somewhere to sit for a while and have a rest and an early lunch. It was only a short distance away on the map, but it seemed to take an age to get there. The pebbles on the beach were slippery and extremely difficult to walk on. 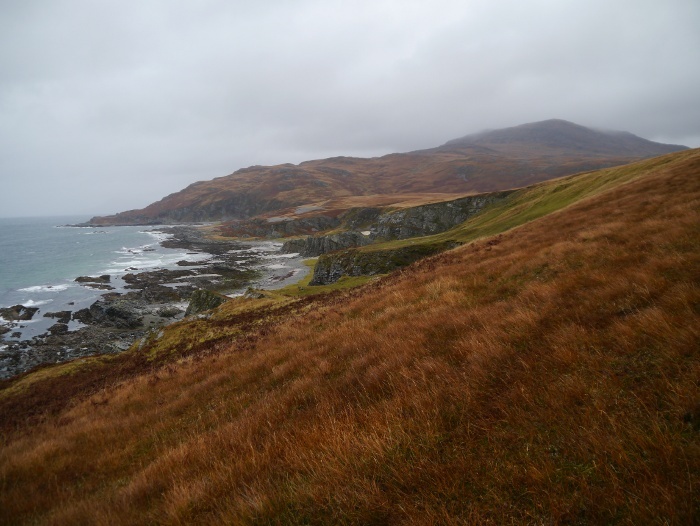 We once again found ourselves cutting across small headlands, grateful that the bracken had died down. 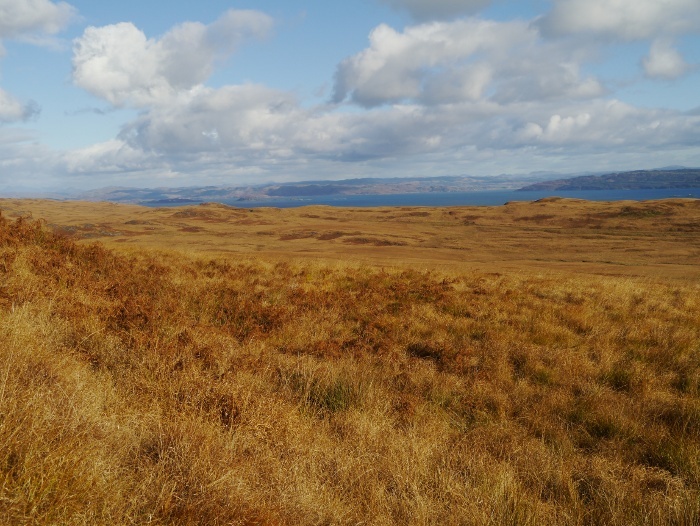 Coastal walking on Jura during the summer months would be hard going through the tall jungle like bracken, no doubt dripping with hungry ticks ready to latch on to your intimate parts. We had actually been really lucky with ticks on this trip. I had found one crawling across my hand near Ruantallain bothy and Rich had a couple on his trousers near Cruib. Nothing managed to latch on to us, a welcome contrast to my previous visit to the island at the same time of year. 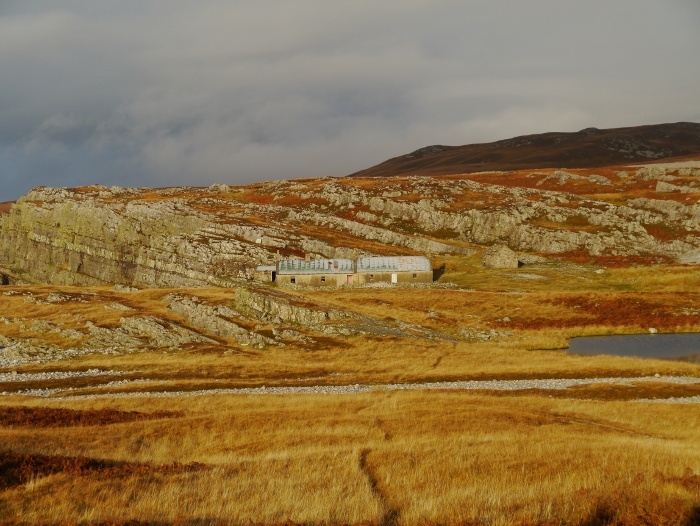 The newly renovated Cruib lodge bothy suddenly appeared below us as we crossed a final headland. The MBA has done a fantastic job at rebuilding the place. I had heard that previously it had been pretty much uninhabitable and in a bit of a ruinous state. 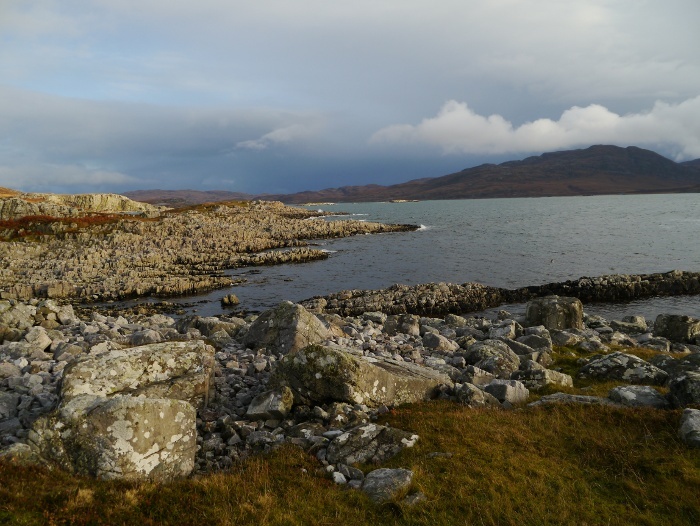 It’s in a prime location right on the shore of a bay on Loch Tarbert. The two rooms inside fresh and welcoming, large windows making the place light and airy. Somewhere to return in future to spend a few days picking fluff out of my belly. Rich pitched his tent in the garden to try to dry it off a bit and I got my stove on for a coffee and hot lunch. 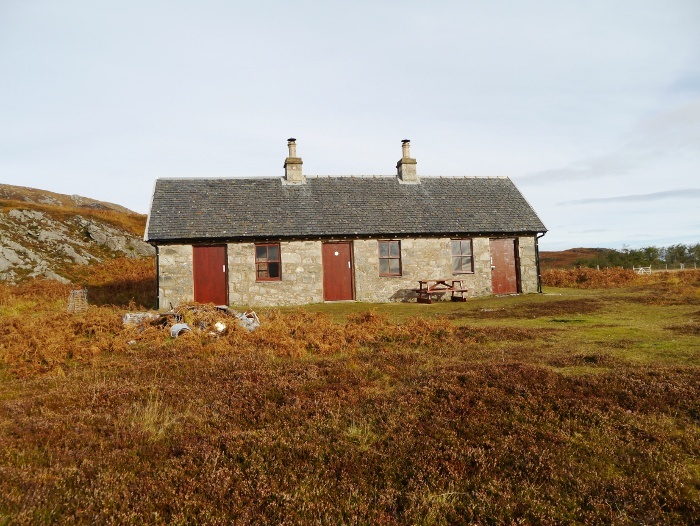 The bothy book showed that the place is already well used despite its remote location. Hopefully visitors will continue to look after the place. I think that we could both happily have pottered around there for the rest of the day, we even had enough food between us to last a couple more days. Unfortunately we had ferries to catch and jobs to go to. 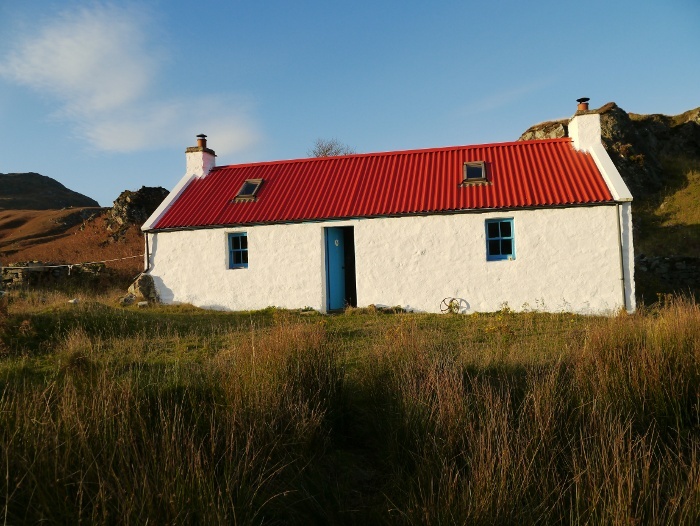 I wonder if there is any paid work to become a full-time bothy bum? 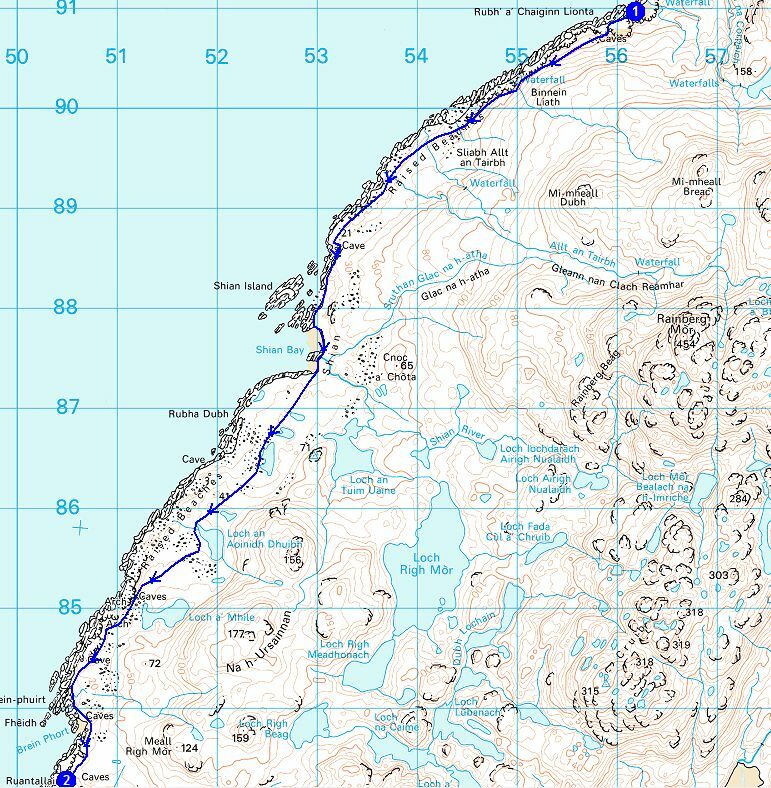 The map shows a track leading from the bothy in a north-easterly direction but after much searching we failed to locate it. We walked the perimeter of a wooded enclosure and finally picked it up on the other side. It then set off with purpose below the steep slopes of the mini mountain Cruib. Once again it became indistinct and patchy before we finally lost it, perhaps confusing it with some animal tracks leading off in another direction. Somehow we found ourselves on the wrong side of Torr an Lochain, I’m not sure how that happened giving such clear visibility. We relocated the track which was visible as two grooves on the opposite hillside but when actually walking it was non-existent. Just like a footbridge that the Ordnance Survey had confidently marked on the map. Luckily the water levels were low as the rocks in the river were as slippery as ice, good fun though watching Rich do his Bambi impression, a video for you to enjoy at the end. We sheltered behind a hillock above Loch an t-sidhean Tarsuinn from a cold wind, a few raindrops in the air getting us to pull on waterproofs. The weather had changed dramatically in the space of an hour. 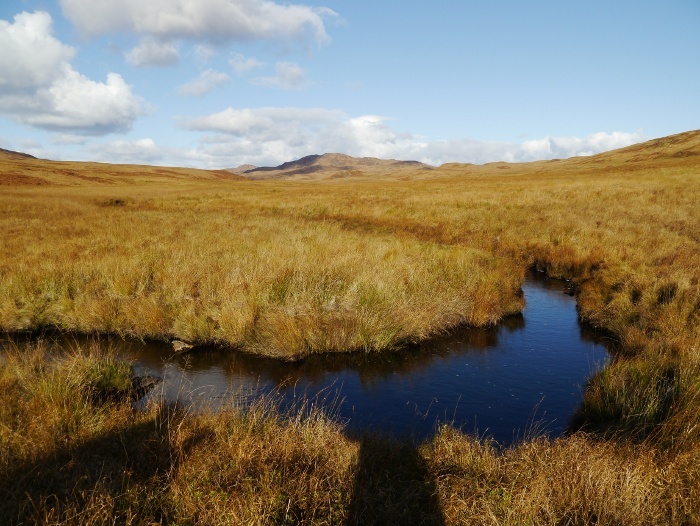 We stood at the top of steep slopes and surveyed the boggy bowl below us, a mass of streams on the map. Thankfully we could make out a network of distinct tracks, one of which led us confidently down hill. We were pleased to find a couple of bridges that were unmarked on the map to take us across the streams. 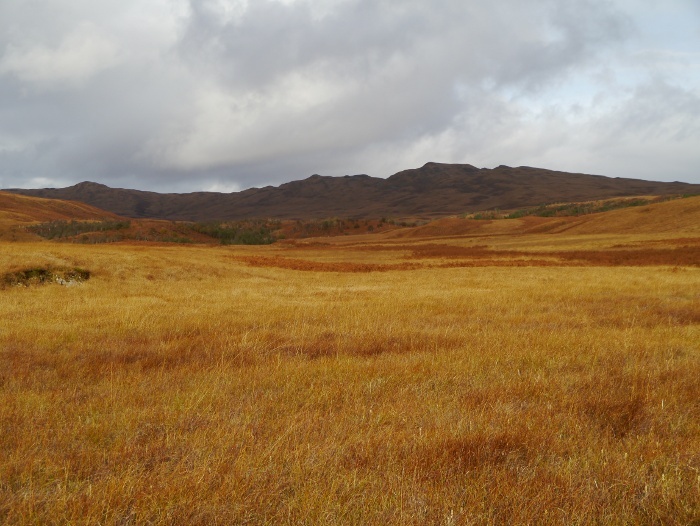 A trudge up to and then along a forest boundary took us across the boggiest ground of the whole trip. It was like walking across breakfast cereal that had been left to soak for far too long. Reaching the thin ribbon of tarmac was like getting onto dry land after being on a boat for far too long. It was strange not to have the ground wobbling below your feet. The walk back to the car felt like it went on forever, the day being long and arduous. 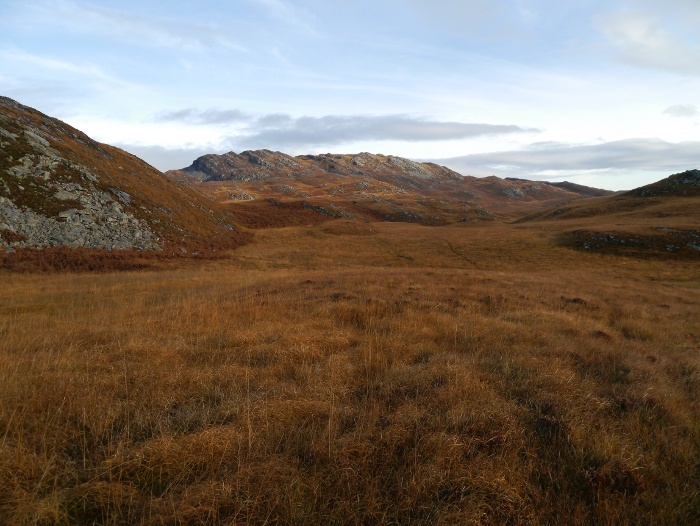 Although only ten and a half miles, we had walked ‘Jura miles’, a solid seven hours of walking with the exception of the break in the bothy. I had taken on the gait of John Wayne, chaffage having taken hold in an unfortunate spot. 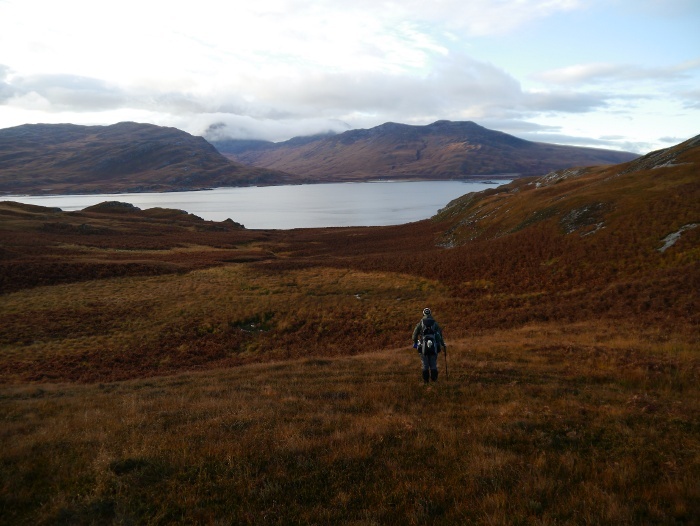 A fantastic four days in the wild with great company courtesy of Rich. As promised here is Bambi on ice. There is something rather dispiriting about driving three hundred miles north to then find yourself heading back in a southerly direction. 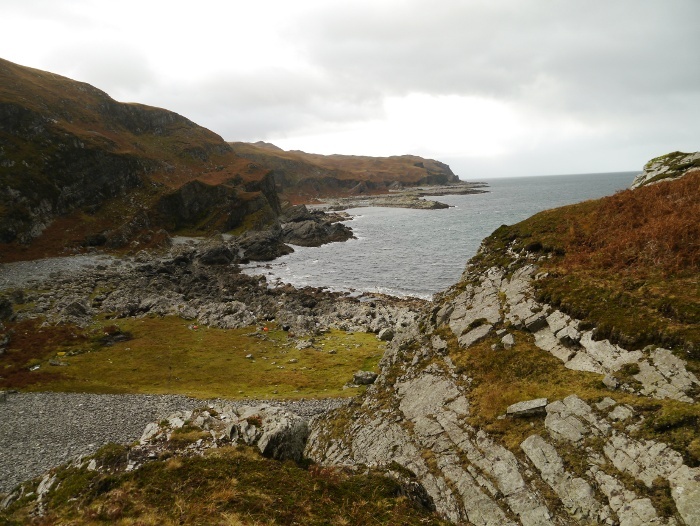 The Kintyre peninsular demonstrates just how convoluted the west coast of Scotland is. The ferry terminal of Kennacraig is over a hundred miles by road from Glasgow, yet a short hop by crow over the Clyde. With a booked ferry and four hundred miles to drive Rich and I set off from Nottingham before dawn. We both marvelled at just how early rush hour starts on the M1, relieved that the traffic madness is not part of our daily ritual. We ended up making excellent progress, so with time to spare we had a wander around the attractive town of Lochgilphead and stocked up with travel sickness tablets for the ferry crossing. We were then first in line at Kennacraig and spent a pleasant couple of hours sitting by the smooth glassy waters edge. Without even a hint of a breeze the sun felt warm, hopefully a good omen for both the ferry crossing and our four day backpack. The ferry crossing was as smooth as can be, which meant that we were able to enjoy Calmac haddock and chips. You get proper cooked food on Calmac ferries and at a reasonable price to boot. We were soon snoozing in comfy chairs, the ferry almost empty of other passengers. Early in the planning stage for this trip I had managed to get Port Ellen (where the ferry arrives) mixed up with Port Charlotte (where the campsite is). I had not realised that I would have to drive across the Island to the campsite, something I did not enjoy after a very long day. It is disorienting arriving at a campsite in the dark, especially when you have not visited before. We were unsure if where we pitched our tents was part of the campsite or the local football ground. 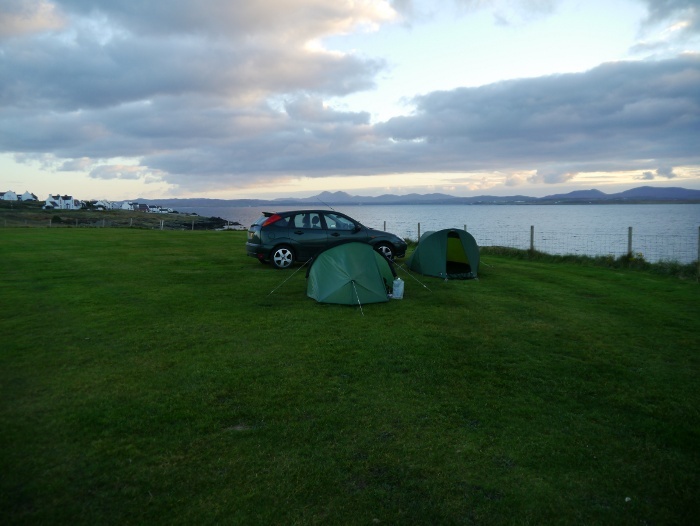 However being right next to Loch Indaal and with a nearly full moon shining on the water it was a perfect spot to spend our first night on an Island. The day before the clocks went back, it was still dark when we got up at 8.00am the following morning. We packed as the sky gradually lightened and the clouds that had formed overnight slowly melted away. 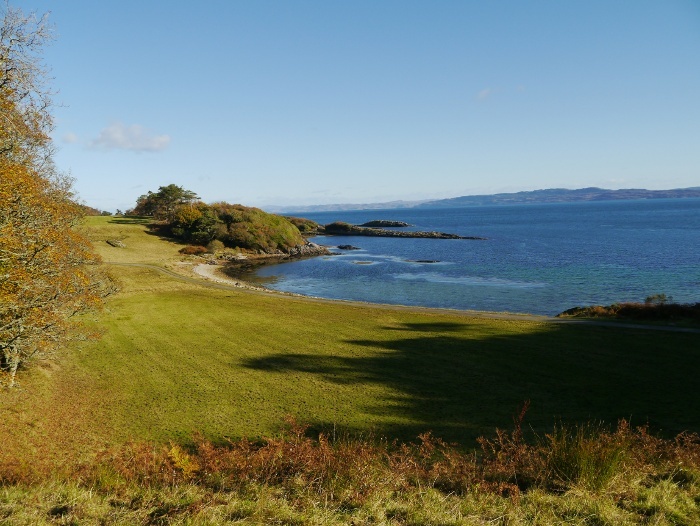 The campsite at Port Charlotte occupies a great location and with tip-top facilities it comes highly recommended. It’s a community project and there is a link to it here. 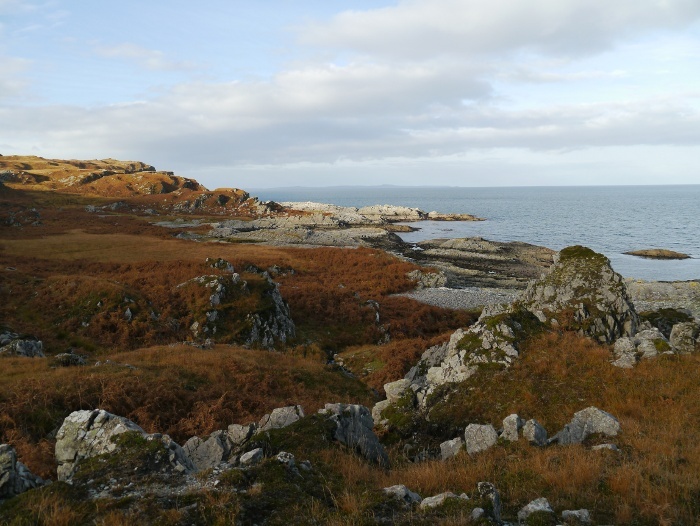 Jura is the only large Hebridean island that does not have a direct ferry to the mainland (apart from a small passenger ferry during the summer months). We travelled across Islay to Port Askaig where a small open decked car ferry plies the five minute crossing to Feolin on Jura. We then drove the twenty five miles to the end of the A846 at the north of the island. This took about an hour and is one of my favourite drives. The road is single tracked, badly potholed in places and often has a nice grassy strip down the middle. It’s rare to get a main road all to yourself, the traffic was almost non-existent. The Paps of Jura looked stunning under the clear blue skies, their summits appearing unattainable above almost vertical scree. I parked just before the A846 becomes a minor road on the ordnance survey map, although on the ground there is no distinguishing between them. 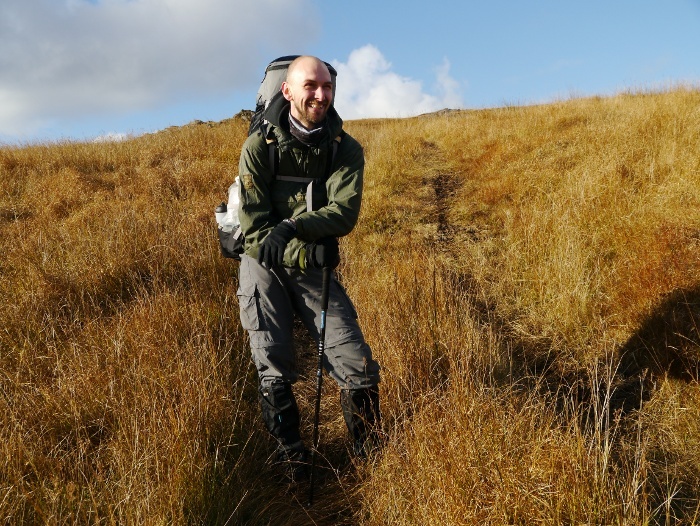 I always get a flutter of nervous excitement before setting off on a proper wild backpack, leaving the comfort and security of a familiar vehicle. 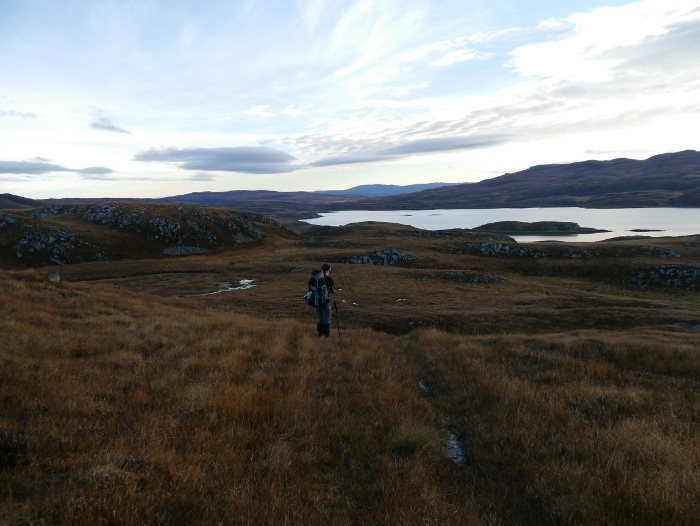 Both of our packs were heavy with winter kit and four days food as we set off north to walk the final few miles to the end of the public road. We could not believe just how amazing the weather was, the sky a deep blue and pretty much cloudless. However the northerly wind had a bite to it, making us zip our jackets against its icy blast. Passing through the few scattered buildings at Ardlussa we stopped to ask a guy if they were planning on stalking in the hills over the next few days. Although the stag stalking season had finished the hind season lasts until February. 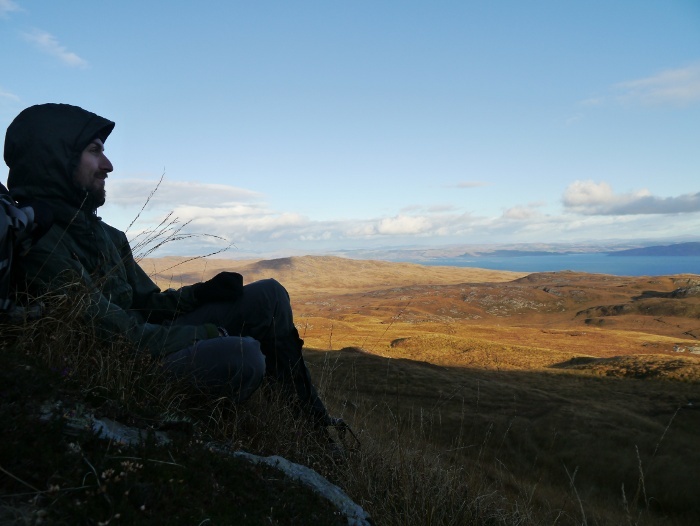 Stalking is big business on Jura, helped by the absolutely huge numbers of deer. He asked if we were doing the ‘Peter Edwards walk’, which we confirmed we were. He told us that there had been lots of people attempting and failing it this summer, not realising just how tough the west coast can be. Peter Edwards is the author of the Cicerone guide to the Island and has a blog called ‘Writes of way‘ I suggest you visit and give him loads of hassle for not keeping it up to date this year. 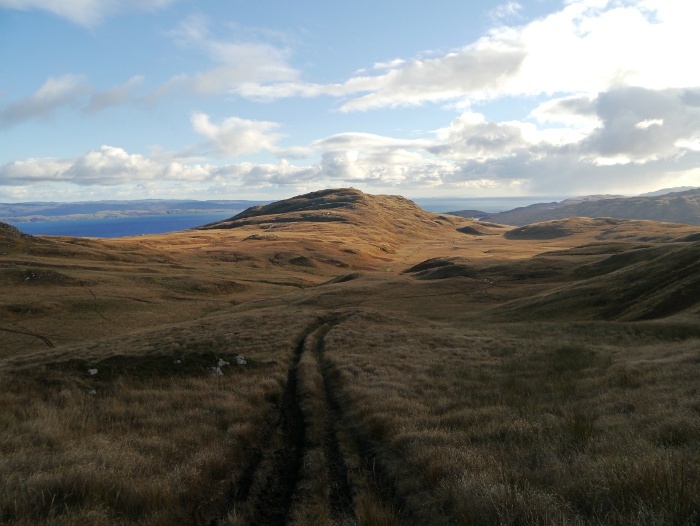 If you ever plan to visit Jura he has done a few excellent blog posts describing various epic backpacks across the island. Anyway, we were informed that no stalking would be taking place until Monday, by then we would be walking across another estate. 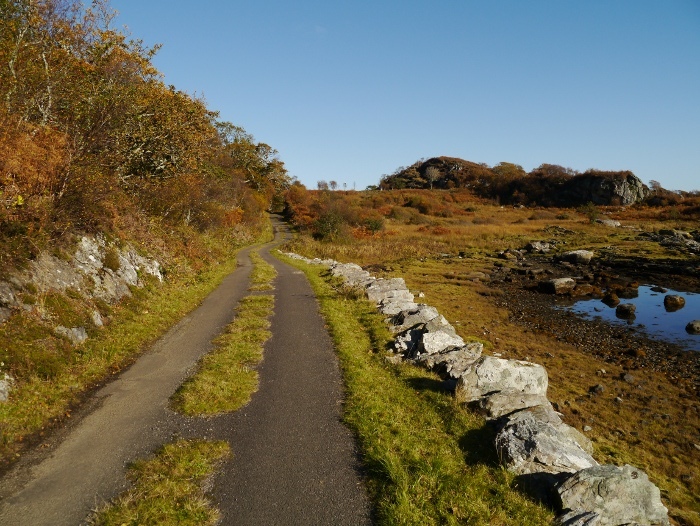 The lane led us past the rather impressive Ardlussa house where we descended to Ardlussa bay. With the calm sea and blue skies it almost looked Mediterranean. The chill air however indicated otherwise. For a couple of miles the road climbed up and down through a beautiful wooded landscape. 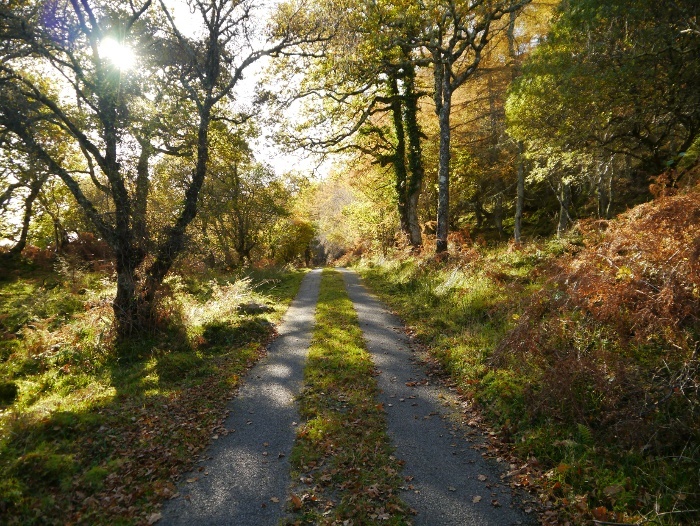 Autumn was at its peak, the canopy above and the bracken below every shade of yellow and brown imaginable. The low sun shining through the branches just added to the magic. A bridge just before the house at Lealt gave a satisfactory perch on which to eat our lunch. The house which we passed is idyllic, sheltered from the elements and like a posh version of the Good Life. A small wind turbine and a bank of solar panels looked like they were doing a good job at supplying power, greenhouses supplying vegetable goodness. I think I could manage to be rather happy living there. Past the house the landscape began to open up, the shelter of the trees left behind. The road began to deteriorate further, becoming little more than a gravel track for the last mile or so. There was a solitary car parked at the small disused quarry at ‘Road end’. I did not expect to see any vehicles there on a Friday afternoon at this time of year. I immediately assumed that they had headed for Glengarrisdale bothy which we had planned to call home for the night. We were both a bit disappointed as we had assumed that we would get it to ourselves for the night. 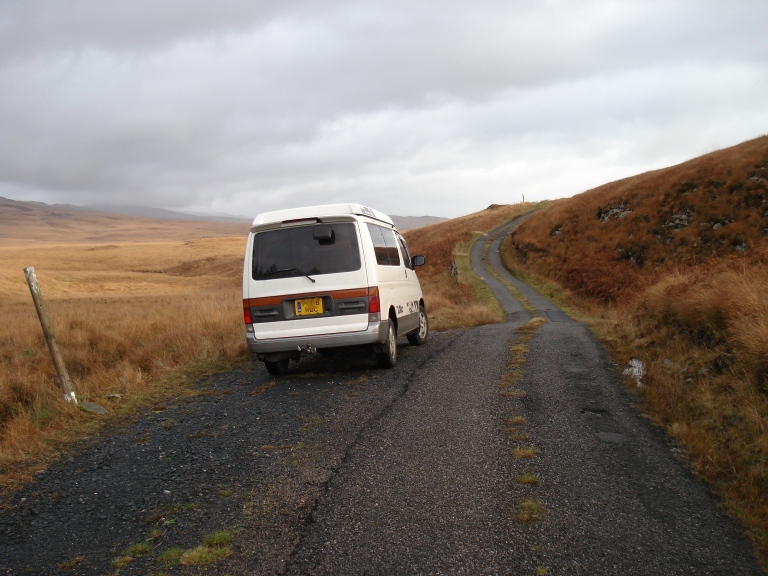 We left the road before the quarry and dropped down to a bridge that had seen better days and crossed the Lealt burn. 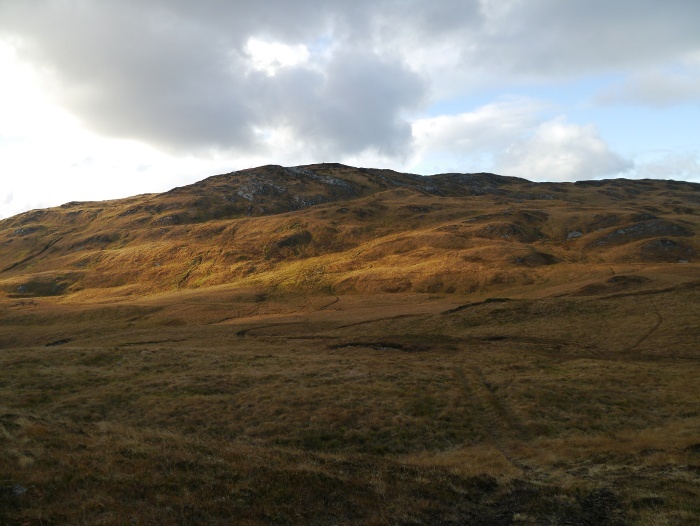 The sunlight on the extensive autumn grasses was spectacular, although there was the knowledge that those brown tussocks could well be causing us some difficulties later. 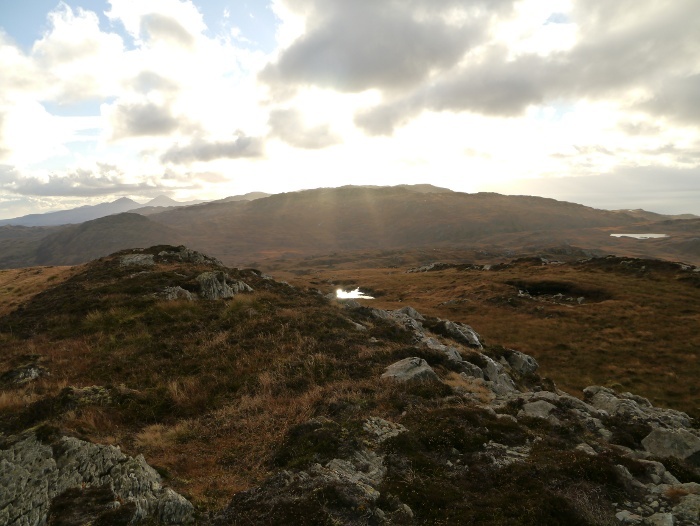 The plan was to climb Ben Garrisdale before dropping down to its namesake bothy. 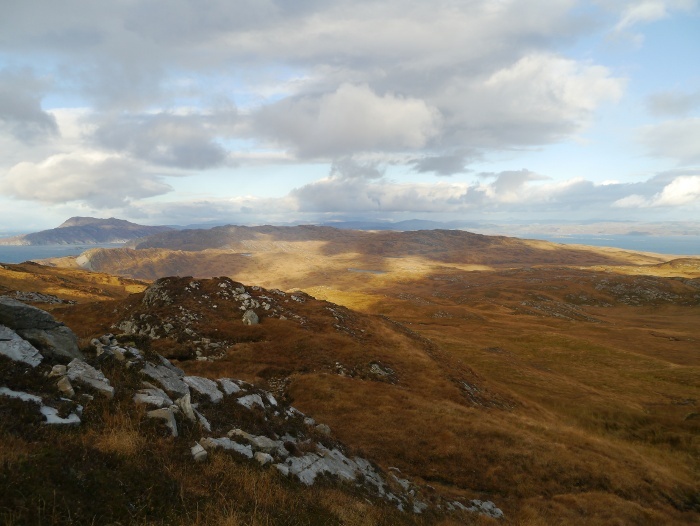 On my last visit to Jura the 371 metre peak managed to defeat me as I was unable to find its true summit, which sits a kilometer away from the trig point. 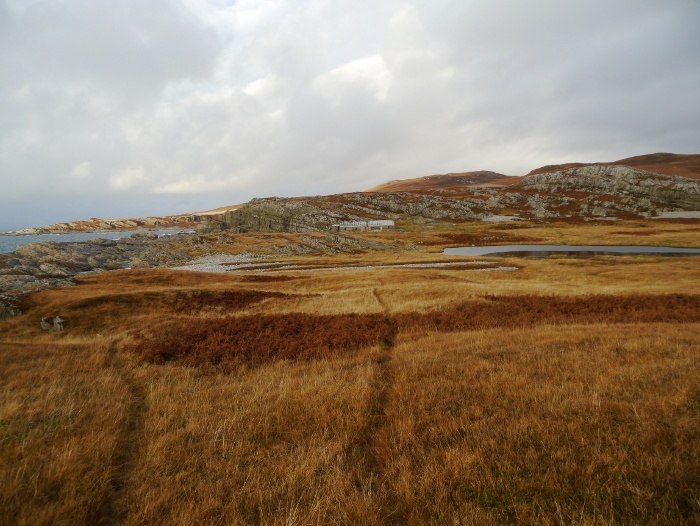 I had descended via a wet argocat track which gave good progress across the sodden tussocks. The same argocat track meant that we were able to gain height quickly and cross the shoulder of Carn nan Gillean. 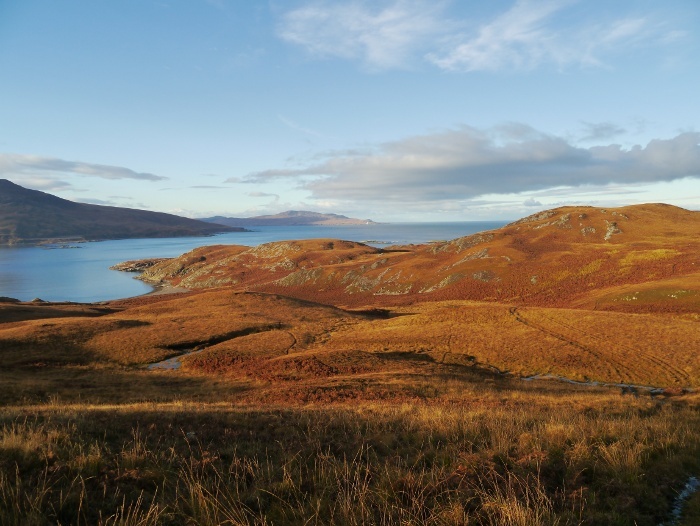 The air was crystal clear giving extensive views across the Sound of Jura and the mainland. Sadly this beautiful part of the Argyll coast appears to be sprouting large industrial windfarms at an alarming pace. We spotted three on the hills above the coast, from a distance looking like giant pin cushions. A huge contrast to the small solitary turbine at Lealt providing local power. 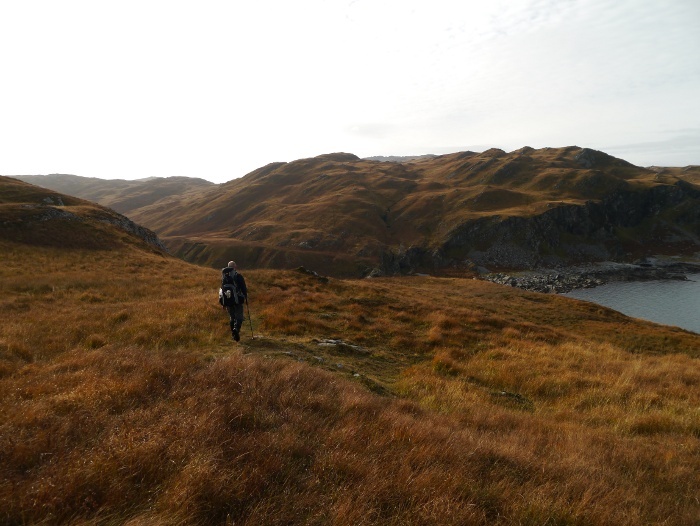 We turned our backs on the industrialised mainland and headed deeper into the wilds of Jura. The distant Paps looked impressive in the late afternoon light, rising up above row after row of low rugged hills. After a long day of travelling and another early start we were both beginning to flag, the small peak of Ben Garrisdale appearing to take on gargantuan proportions. In reality we only had to climb 150 metres but this took a large amount of effort with heavy packs and wobbly legs. The wind was getting stronger with height, the temperature dropping enough for the ground to be partially frozen underfoot. Close to the summit we found a sheltered spot out of the wind, a place to refuel and take in the huge views, trying to guess the large conical mountain in the distance. My money was on Ben Cruachan. 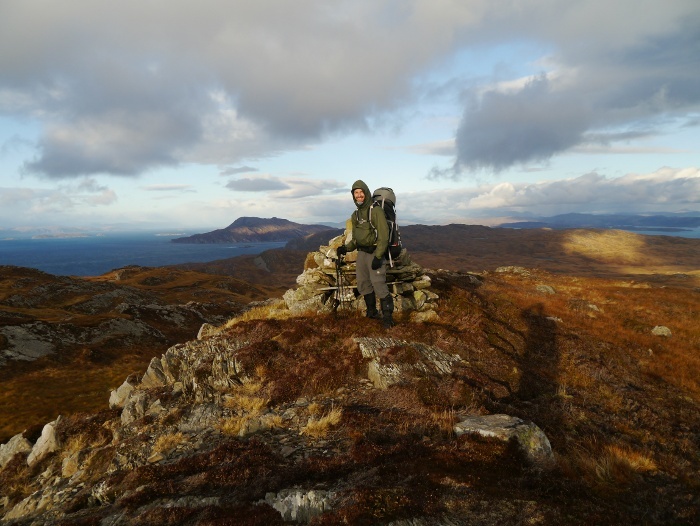 The summit itself was marked by a surprisingly large cairn sitting proud on a rocky outcrop. The views were extensive for such a low summit, being on an island close to the sea does that. It’s height makes it a hill, although when standing on its craggy summit it is definitely a mountain. Mountain or hill it was perishingly cold, my Kestrel 3000 device measured a wind chill of minus six celsius. It would have been good to linger but the light was beginning to fade so we set off towards the west coast. 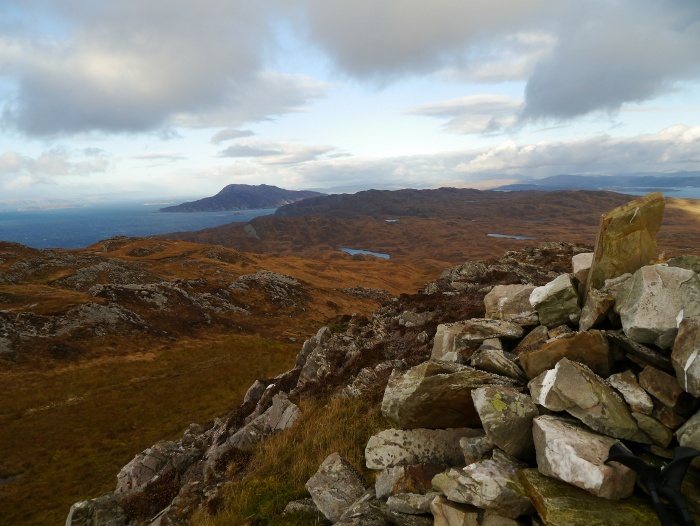 The original plan was to head across to the trig point and follow the ridge down to the bothy. 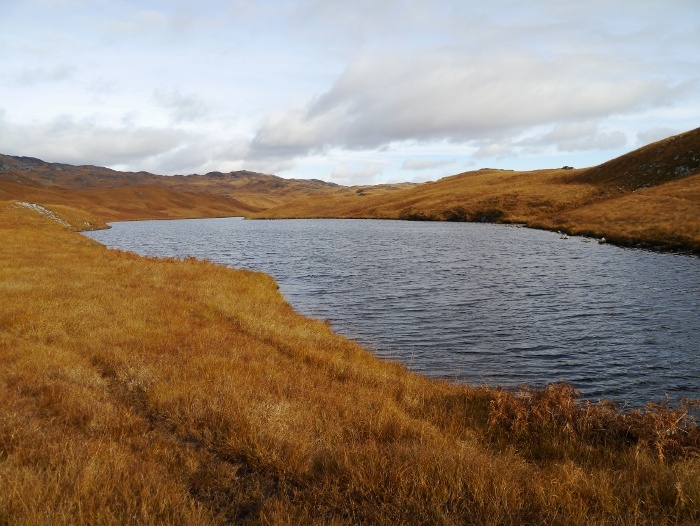 However at Loch Fada Ben Garrisdale lassitude began to set in and we could not be bothered to do any more climbing. In retrospect this ended up making the rest of the day much harder. Instead we started a contouring descent into Coire Gorm. 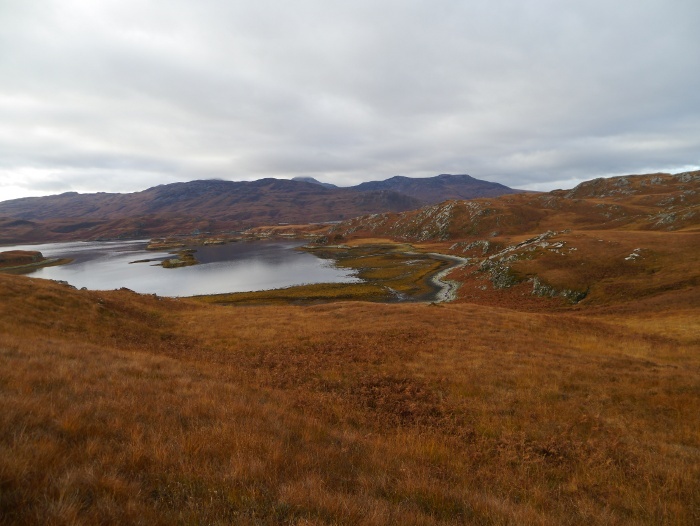 The bothy appeared far below us spurring us on, but the terrain meant that the going was slow through bog and tussocks. We would find a deer trail and follow it for a while, the groove worn by hooves making walking much easier. However the deer rarely went where we were heading and it was soon back to a descending lurch through deep vegetation. 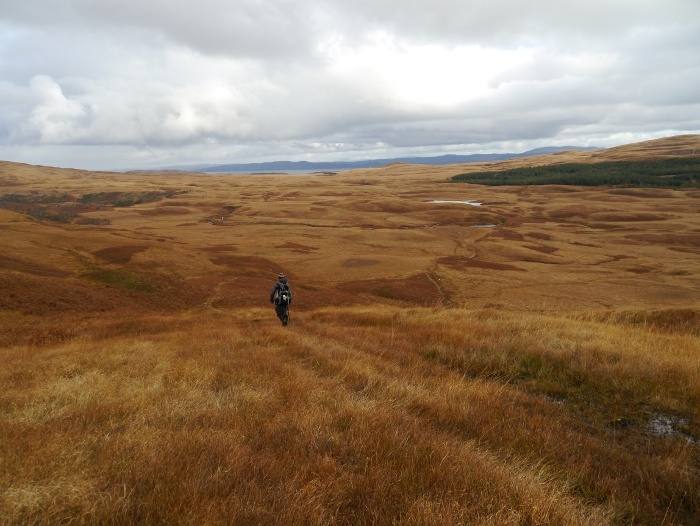 It was with relief that we reached the boggy floor of Glen Garrisdale. 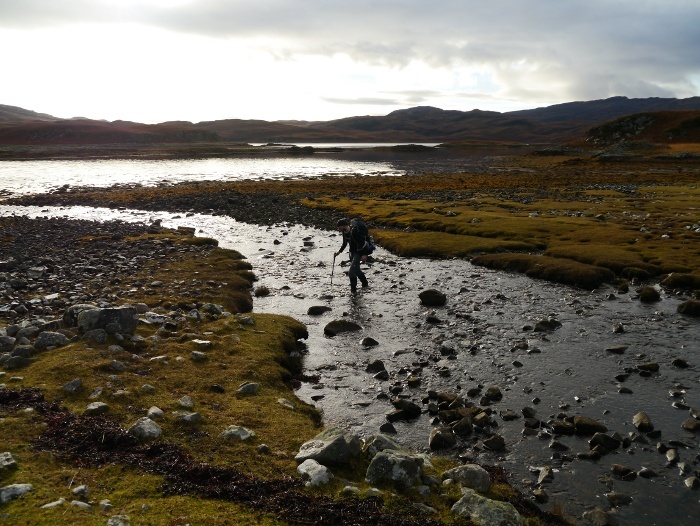 The river was easy to cross and we managed to pick up a well-defined track to the final ford just before the bothy. We expected in the gathering gloom to see smoke drifting from the chimney but there was none. It was a pleasant surprise to find no one at home after expecting to find the place occupied. We were both so knackered that we could barely speak, so were relieved that we would not have to make small talk with a stranger. It was too late to go off in search of driftwood so we made a fire using a small amount of the wood that was already there. 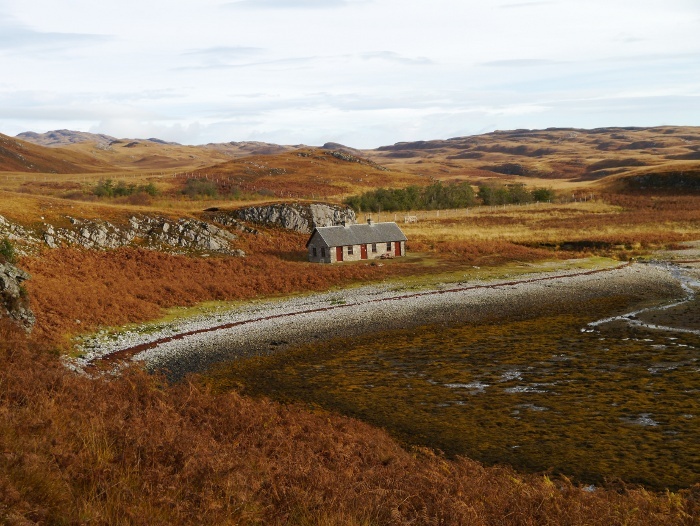 Bothy karma after leaving fuel in previous bothies. After dinner we retired to our sleeping bags, each of us having one of the downstairs rooms for a snore free night. It did not take me long to drift off. Dawn came late once again and we had breakfast by torchlight. 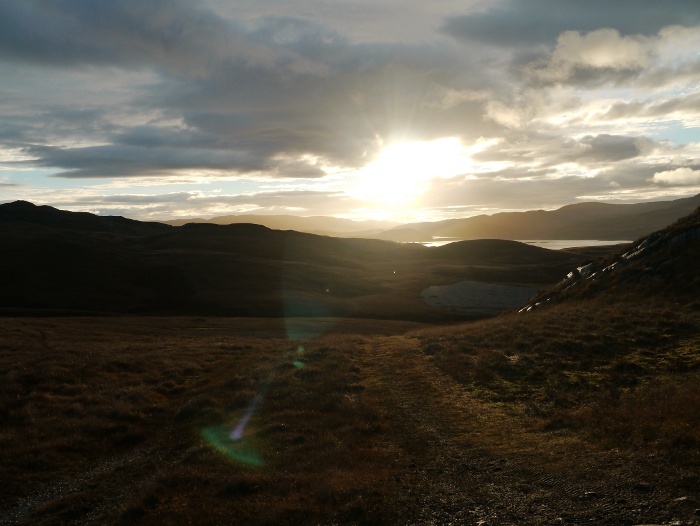 As the sun came over the hills and warmed the bothy Rich set off to explore the bay whilst I shuffled around the bothy, enjoying the surroundings. 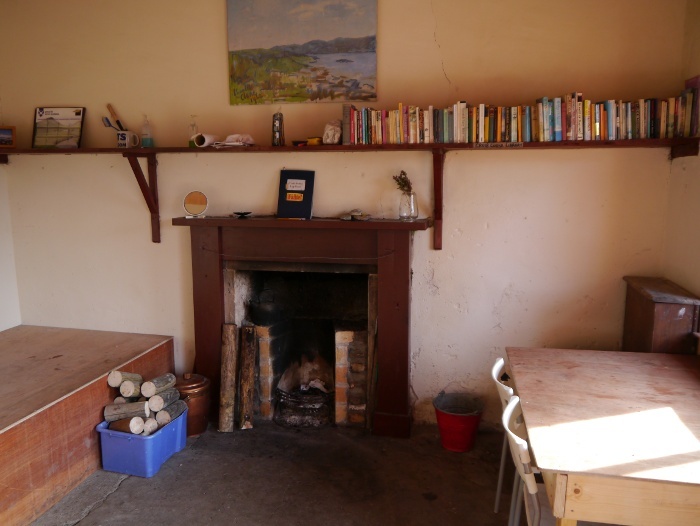 The bothy occupies a lovely spot and is very well cared for. It’s whitewashed walls and red roof give it a homely atmosphere in such bleak and rugged surroundings. We set off at about 10am under clear blue sunny skies. In retrospect it would have been better to have set off at dawn to beat the wet weather that quickly enveloped us later that afternoon. 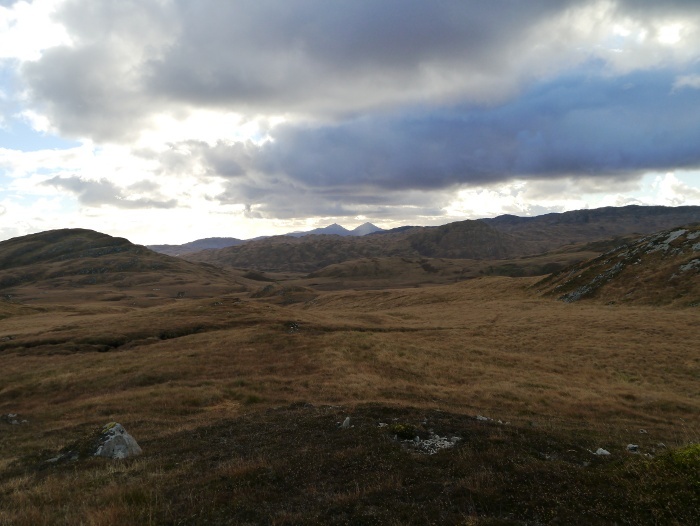 There was a real feeling of the calm before the storm, the wind had totally dropped and we were soon down to base layers as we climbed to a low boggy col before dropping down to Bagh Gleann Speireig. It was nice to be walking close to the water’s edge, the smell of the sea in the air, rocks crunching underfoot. 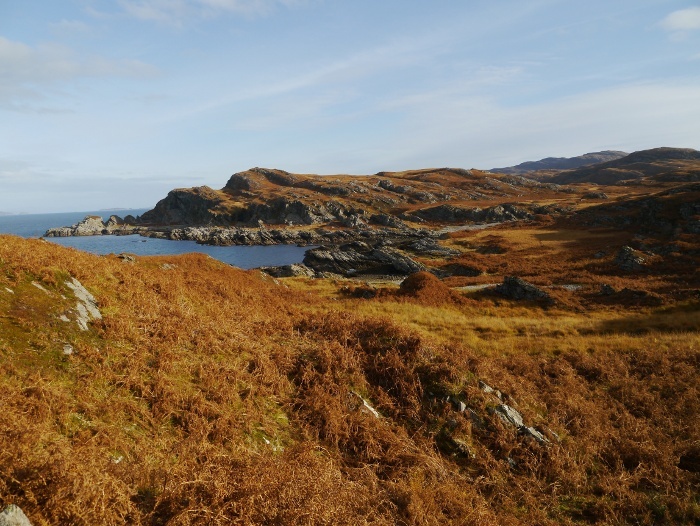 At the end of the small bay we started climbing through a tangle of dead bracken as we were not sure if the coastline ahead was navigable or not. The climb was worth it for the views across the bay. The going underfoot was easy so we ended up climbing higher than originally planned. 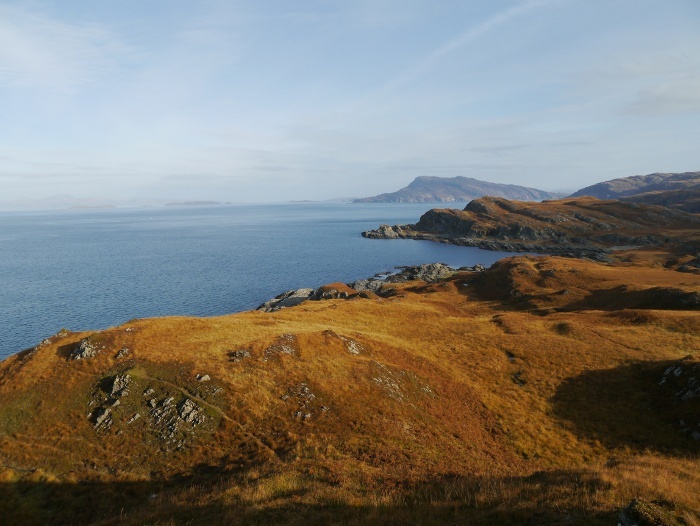 My eyes kept on being drawn to the island of Scarba across the Gulf of Corryvreckan. It is pretty much just a single hill rising from the sea and is uninhabited for much of the time. I dream of chartering a boat to drop me off there, returning a few days later to pick me up. 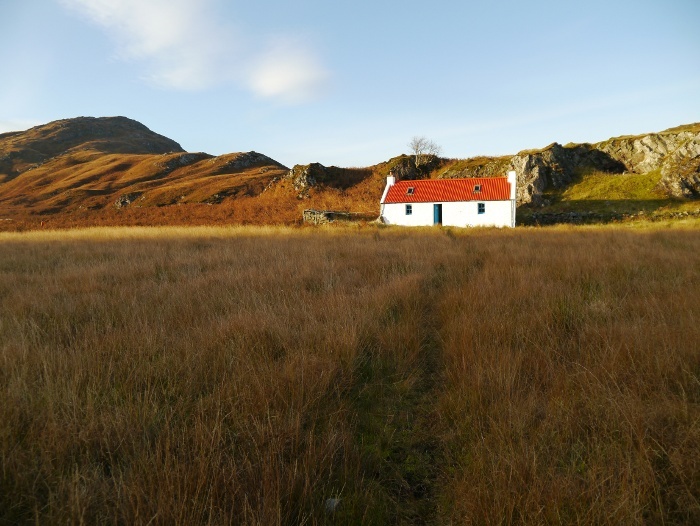 An open bothy could provide shelter if the weather turned bad. Maybe next year. Maybe. 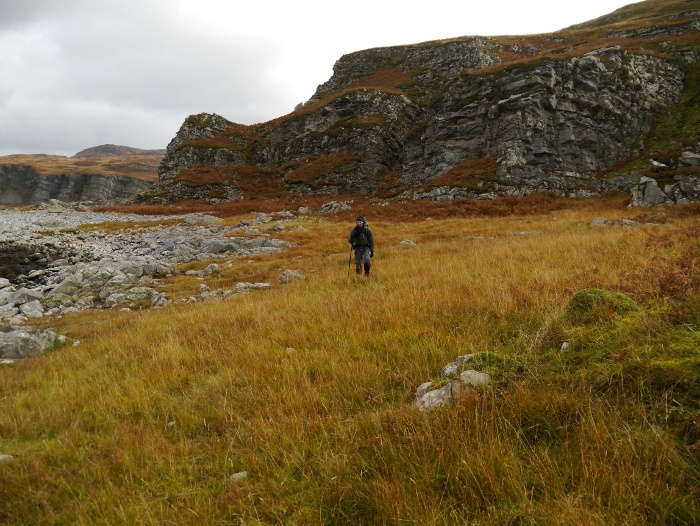 Walking across the grassy plateau we noticed that the cliffs on the other side of Glendebadel bay became higher, the hills above those cliffs bigger. From an airy perch above the bay it looked like it would be possible to follow the coastline to the headland. From our position we could not tell what was beyond. 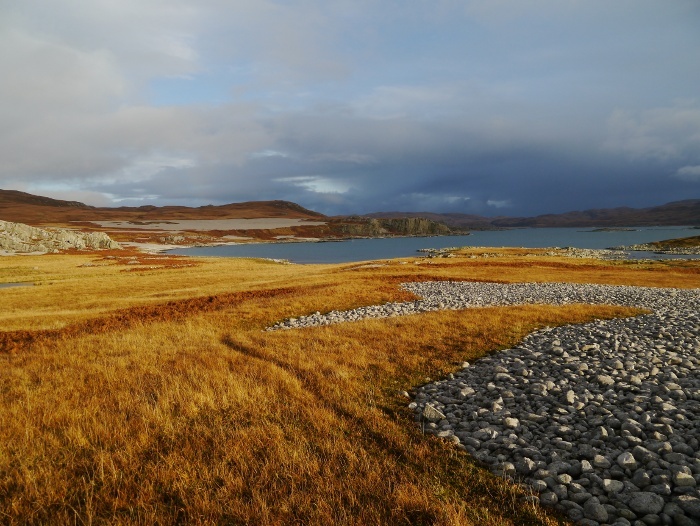 With pathless coastal walking you never really know what is round the corner. A map often only tells half a story. Is the flat area next to the sea going to be easy grass or greasy rocks at a difficult angle? As we descended down to the bay we noticed that the weather was beginning to change dramatically. The clear blue sky had been chased away by a wall of grey and a breeze had started to pick up. 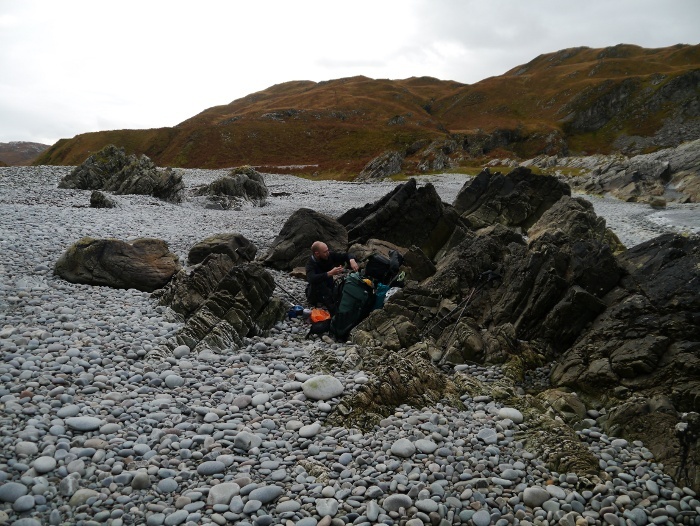 Although early we decided that the sheltered bay would be a good place to stop and sit for lunch. The beach itself was made up of large smooth rounded pebbles, the sort that would make a great feature stacked next to a slate fireplace. They look lovely but are a real bugger to walk across, they’re also not that comfy to sit on. A few early spots of rain got us pulling on our waterproofs as we headed round the bay. What had looked like easy walking from above turned out to be slow going and awkward as we boulder hopped above the shore line. It was with relief that we found a section of grass to walk along, even tussocks are easier than slippery rock. Our luck soon ran out and the coastline looked like it was going to become increasingly difficult. By sticking religiously to the water’s edge we realised that it would take us hours to get to our planned camp spot for the night. We were also aware that the weather was going to start deteriorating. We therefore climbed onto the hills above, following a succession of deer and goat tracks. Both of these mammals are numerous along this stretch of coastline. Wherever you look there is often a stag staring at you from a lofty perch. Suddenly it will become spooked and you will see it running nimbly across the hills, hinds in tow. Occasionally we would pass a patch of bracken with a pair of antlers sticking out. Then all of a sudden a herd of well camouflaged beasts will be scattering up the hillside. The goats often tend to stick closer to the coast, lines of them walking precipitous paths above the cliffs. Once we got a good whiff of them, not a pleasant smell and one of the reasons I no longer eat goats cheese! 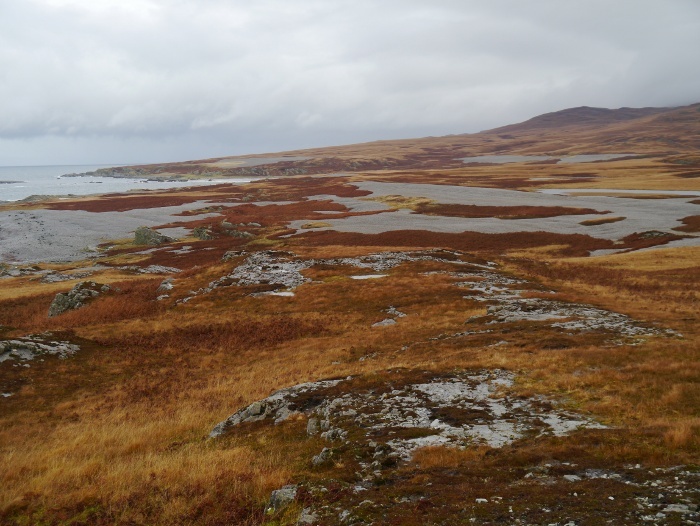 At one point we found ourselves nearly a kilometre inland and one hundred and fifty metres above the sea. We ended up ignoring the map and simply picked our way across the moors, determined to avoid as much climbing as possible. This was difficult as a series of ill-defined ridges fall towards the coast. Therefore it feels that you are always going up hill, level ground being in short supply. The end of the day was spent walking in persistent rain, the wind picking up. It was forecast to get worse through the evening and night so we decided that we would find as sheltered a campsite as possible. A line of cliffs finally gave way to Corpach bay below us. As we approached the cliff edge we spotted a mass of goats and deer legging it to safety. I suppose that they have a reason to be fearful of humans as there is the likelihood of being a target of a gun. Even the goats are hunted on Jura. There was no way directly down to the beach so we contoured inland above the cliffs, before finally picking a way down to sea level. Corpach bay had some great grassy pitches right next to the beach but they were not sheltered from the now strong wind. About a kilometre down the coast was marked another bay Traigh a Mhiadair, which had looked a much better proposition from above. A section of raised beach between the two bays made the going difficult. However once we reached the other bay we were glad we had made the effort. It was a splendid spot with large flat grassy areas above a lovely sandy beach. We wandered around for a while, trying to find a spot that provided shelter from the wind. 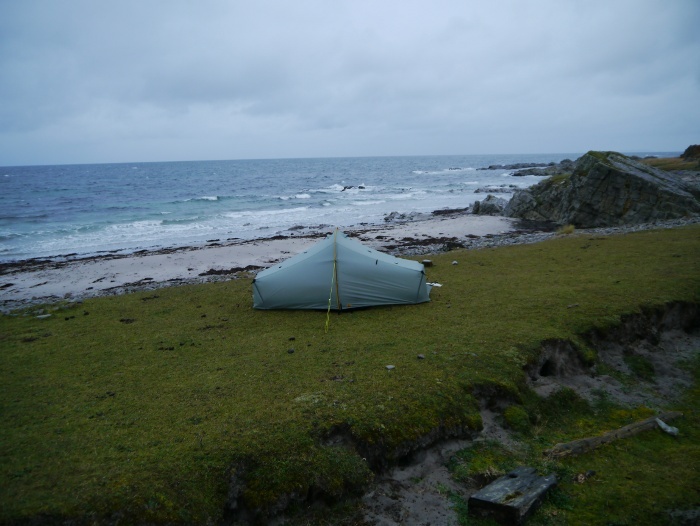 I quickly pitched and was glad that I had brought the Scarp1, which stood up fantastically to the constant battering. Rich’s Laser Comp however caused him a little bother and proved difficult to pitch in the wind. I collected water from a nearby waterfall and bade Rich a good night. Although still early it was not an evening to be sitting around outside. The original plan of having a driftwood fire in a cave had diminished in its appeal. It was with relief that I got into my tent and stripped off my wet clothing. There are not many places left in the UK where you can walk for four days amongst jaw dropping scenery and not see another person. 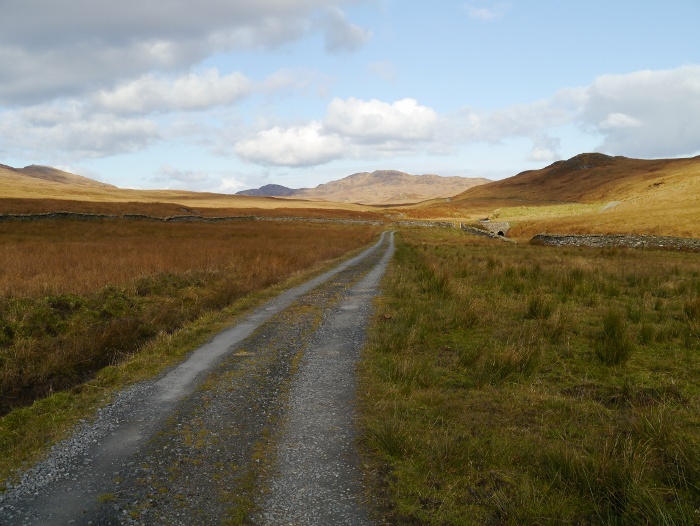 Once we left the single track road we had the hills, coast and bothies of Jura all to ourselves. The reason for this became apparent as we made our way down the west coast, the going can only be described as ‘character building’. The weather threw pretty much everything our way. I have an overriding memory of walking directly into the teeth of a gale with heavy rain being blown into my face. There was nothing I could do to prevent that cold trickle of water running down my chest! I will do a write-up later in the week. 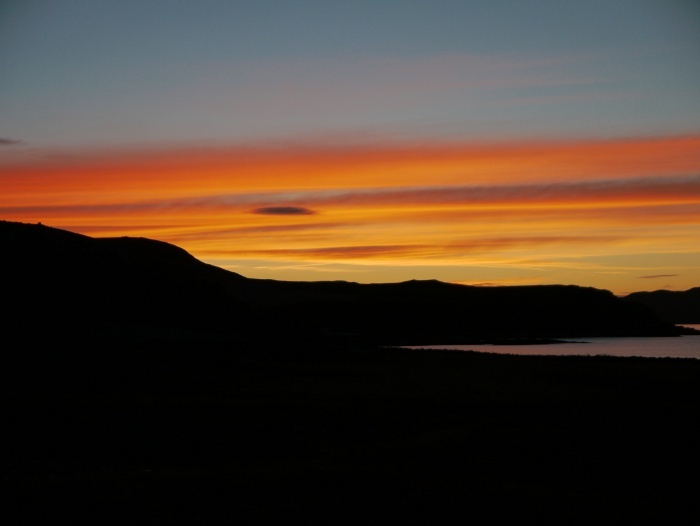 In the meantime the photo below was taken from just outside Ruantallain bothy, possibly now my favourite spot on earth. Twenty four hours of constant wind and rain was beginning to clear just as the sun was setting behind the northern tip of Islay. Why no TGO Challenge in 2012? In retrospect I really enjoyed the TGO Challenge this year. Admittedly at the time there were moments whilst actually doing it where I thought to myself ‘what the hell am I doing?’. This was most certainly the case after I got blown off course by the big storm and found myself walking the Deeside Way into Aberdeen. The weather this year made for a difficult crossing, day after day in full waterproofs often reduced the morale of this solo walker. However there were lots of magical moments, especially whilst crossing huge areas of wild land. The camaraderie of fellow Challengers was second to none. I am keen to get a few more Challenges under my belt. However, I have decided not to enter next year. The reason why remains the same as it had been for many years prior to this years entry. It simply takes out too big a chunk from my precious annual leave. Next year I fancy condensing my Scottish wilderness fixes into smaller chunks. Then as summer turns to autumn I am considering doing something really ambitious. 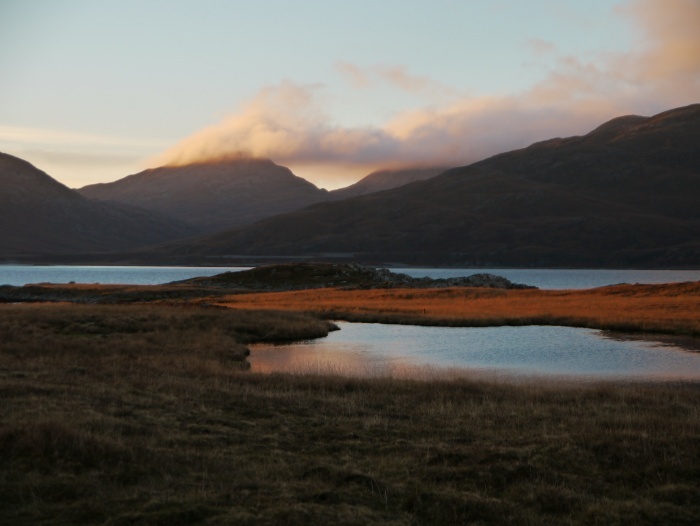 In February I am returning to what I consider to be one of the wildest, most remote parts of Scotland. 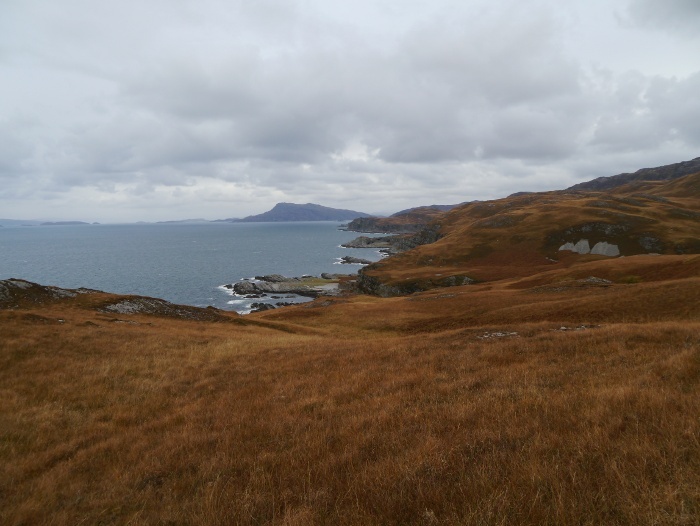 In October 2009 I did a short backpack on the Island of Jura, walking along a small section of the west coast. The wild west of the island really made an impression on me, it is simply one of the most beautiful and at the same time bleak places that I have visited. A trip has been planned with Peter Edwards, his wife Fiona and hopefully my buddy Rich. 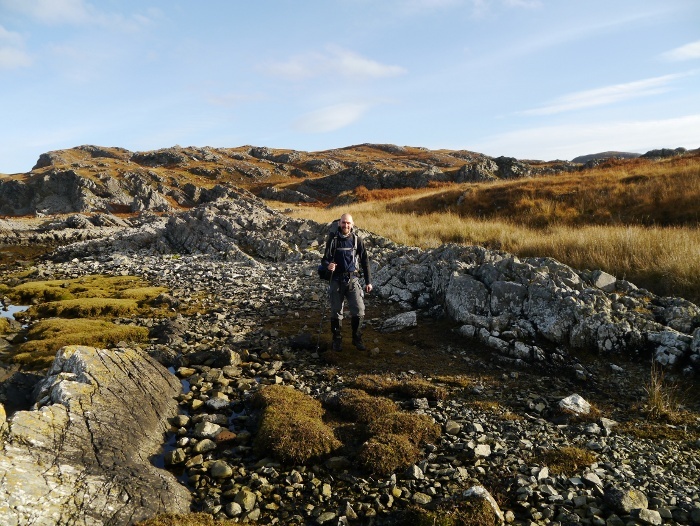 As well as being a very decent chap, Peter is also the author of Cicerones guidebook; Walking on Jura, Islay and Colonsay. 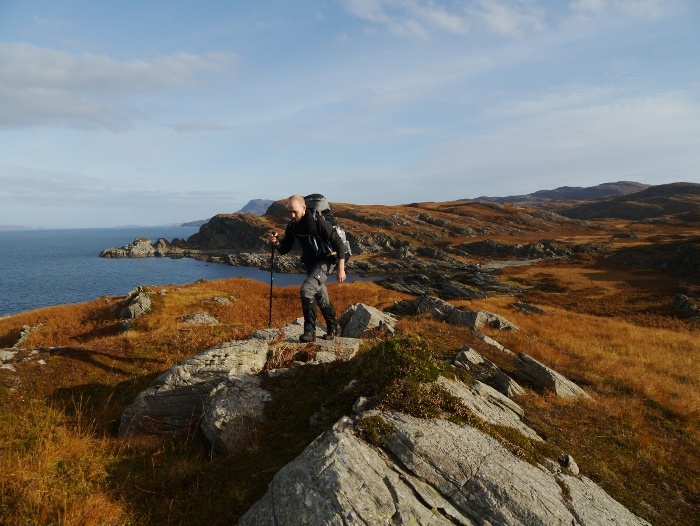 A substantial part of the guide is dedicated to a five-day backpack along the west coast. 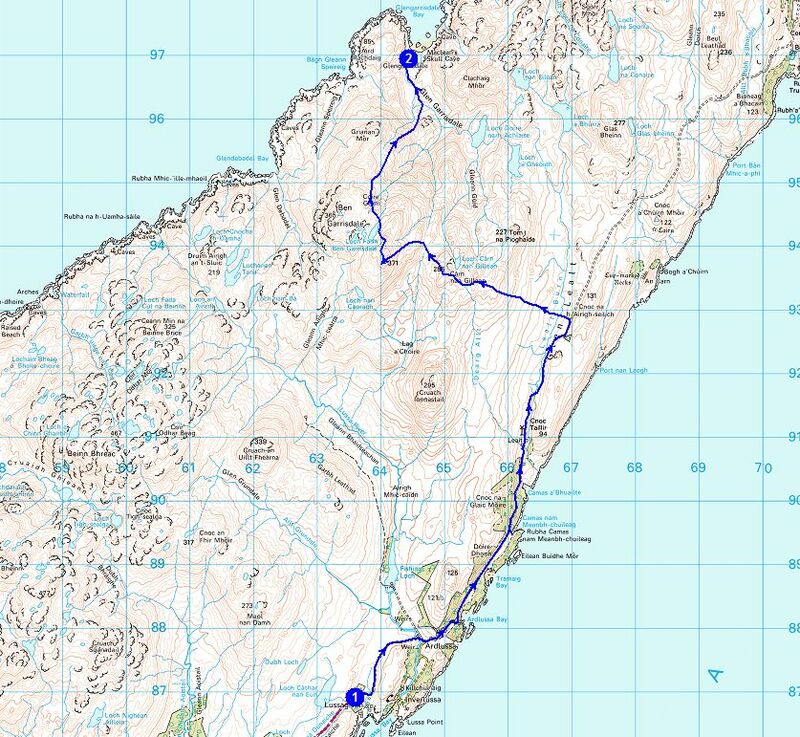 It is that route which we will be walking and it will be great to leave the route finding to someone who knows the area so well, it’s tough going there! Reuben the Staffy and Dougal the Chocolate Lab will be coming along, kitted out with their own backpacks. 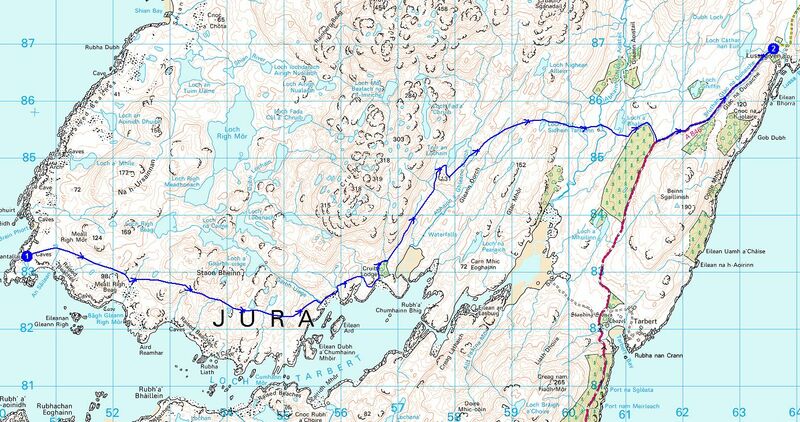 Jura is probably the worst place in the Highlands for ticks, hence taking the hounds in February. 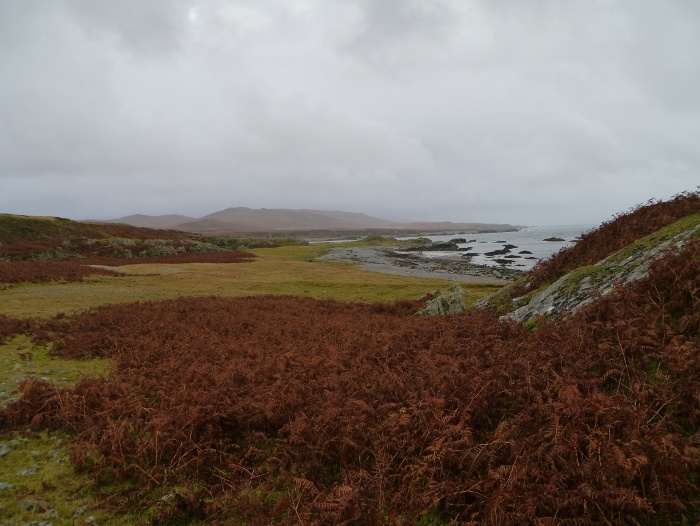 In winter it’s not the easiest place to get to; a long ferry journey to Islay, followed by a bus or two across the island, then another ferry to Jura itself, before finally catching the bus to the north of the island. To cut out all that travelling and to add an extra bit of adventure we are planning on hiring a boat to take us from the mainland and drop us off in a convenient location. It’s already making me feel giddy with excitement! 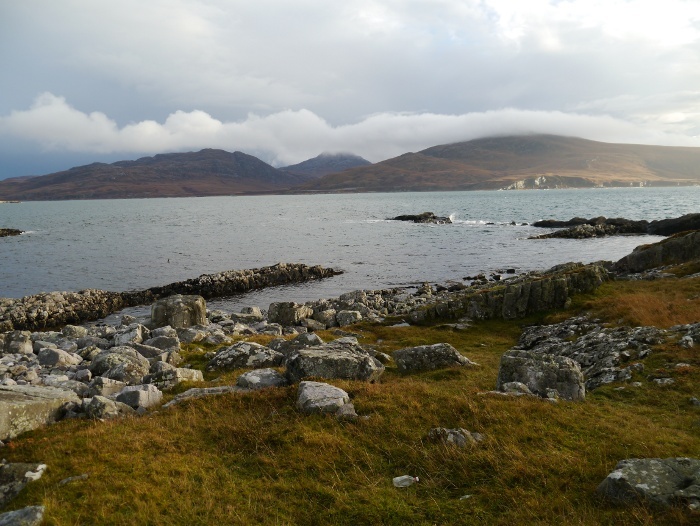 The wild west coast of Jura. In April I sadly turn 40, so in celebration there will be another trip to the Highlands. My partner has agreed to us renting a cottage of my choice for a week where I will be able to climb mountains everyday. I plan to find somewhere stupidly remote…………….. The big one planned for next year takes me to a place that only a few years ago I would have thought impossible to visit independently. Greenland has held a fascination for me for a while now, however is it a place suitable for backpackers? An article a while ago in TGO magazine by Paddy Dillon sparked an interest which soon turned into a strong desire. He has recently written a guidebook to the Arctic Circle Trail which I have purchased. Follow the link and I think that you’ll agree that this trek looks simply awesome. Reading the guidebook makes my heart skip a beat. Fingers crossed and all going well I should be above the Arctic circle this time next year. You may have gathered that I do enjoy a spot of trip planning! Once again I am playing the, “Whats the weather going to do next week?” game. I have a major plan in place for the period between Christmas and New Year. 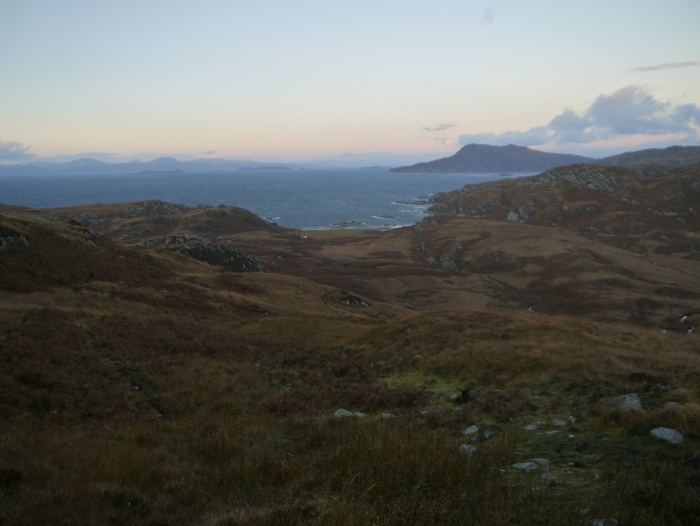 Late last autumn I fell in love with the wild west Coast of Jura and I have spent a lot of time since then dreaming of returning. Much of this has been down to Pete’s numerous posts about the Island on his blog ‘Writes of way‘. 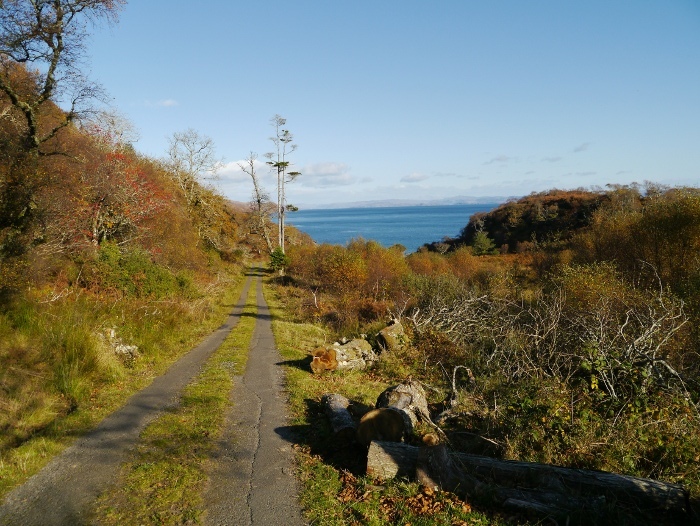 I am planning on doing the hefty drive up to kennacraig on the Kintyre peninsula where I will get an early morning ferry to Islay. A drive across the island to Port Askaig where a tiny ferry will take me across the Sound of Islay to Jura. 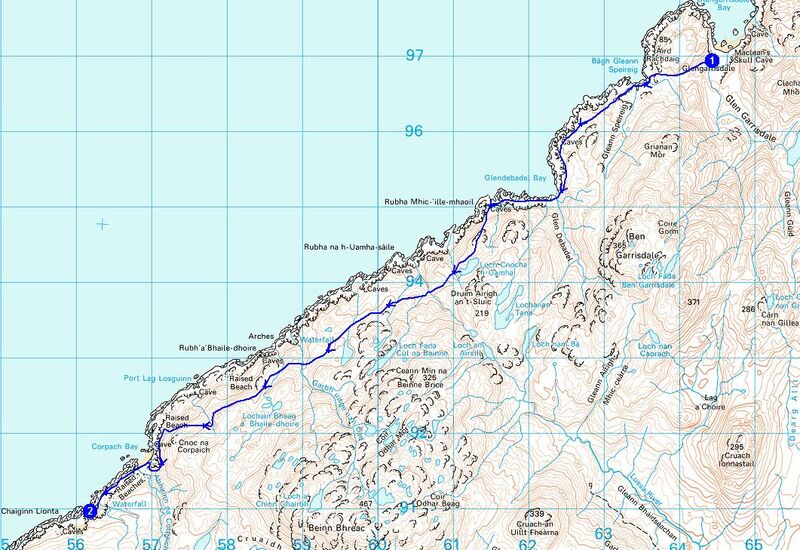 I will then take the single track rollercoaster road to the north part of the Island where I hopefully should be able to park up almost exactly 24 hours after leaving home. The main A846 across the island! 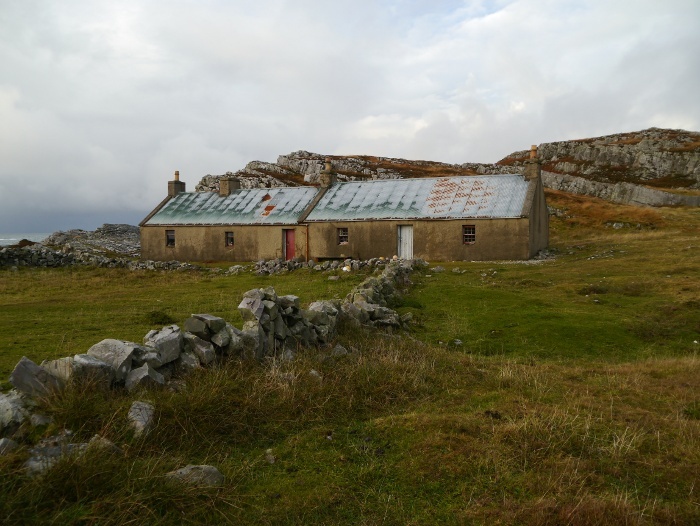 My rucksack will then be hoisted onto my back for a 5 to 7 hour walk across some of the roughest, boggiest terrain imaginable to a rather splendid coastal bothy. Three days to watch the wildlife, walk to isolated sandy beaches, explore caves and rock arches. Then long old nights to listen to the waves breaking on the shore whilst attempting to burn driftwood and reading trashy novels. However will the weather let this happen? Firstly a snow free journey up north is pretty much essential, so no snow between Nottingham and the Clyde please in the next few days. 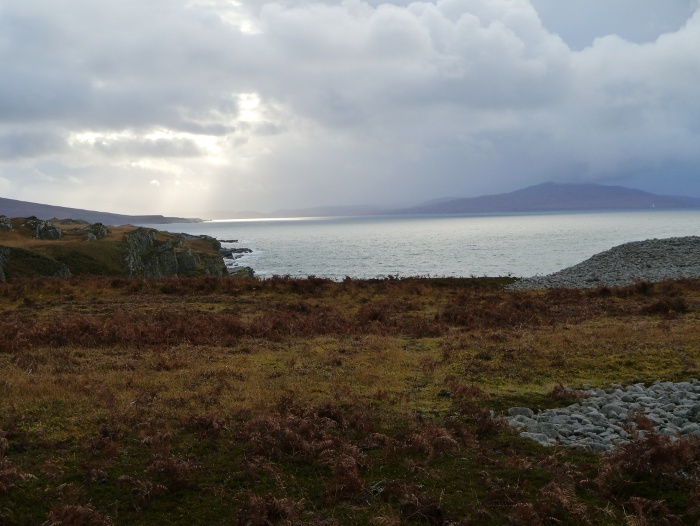 Then I would prefer the weather to be kind (ish) whilst on Jura as I don’t think I could cope with the very short days whilst being lashed by an Atlantic storm. Decision time on Friday I think, I will then book the ferry. Fingers crossed that this time next week I will be amongst this scenery. Heavy snow is forecast for Nottingham tonight…………………………..